It's hard to explain the significance of a night market to someone who hasn't spent time in East Asia. 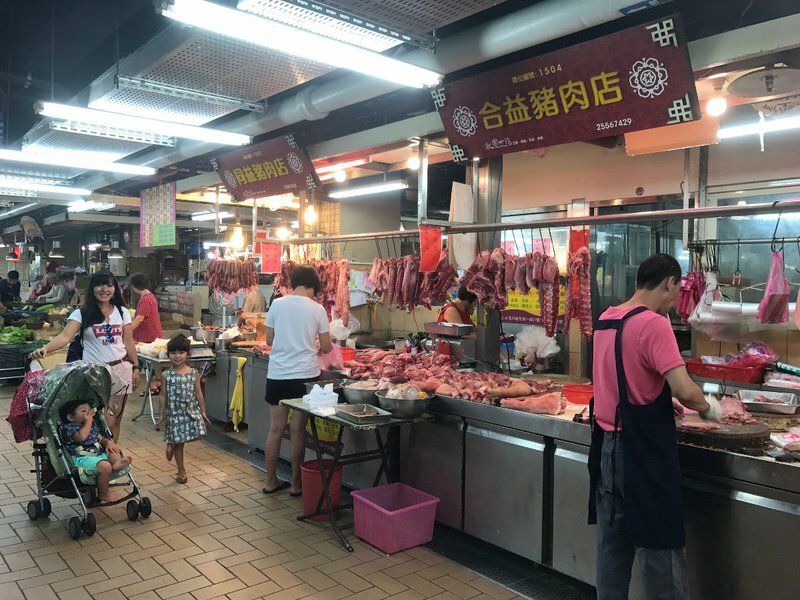 These unique markets are ubiquitous in China but also found in major cities throughout Southeast Asia and anywhere in the world where there is a large Chinese community. 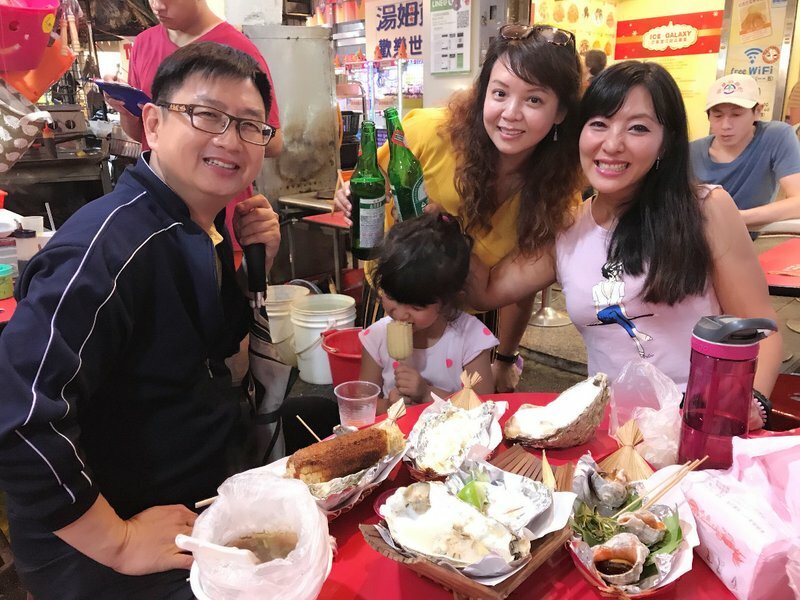 Eating is naturally a major aspect of visiting a night market but the social experience transcends the simple act of filling one's stomach. 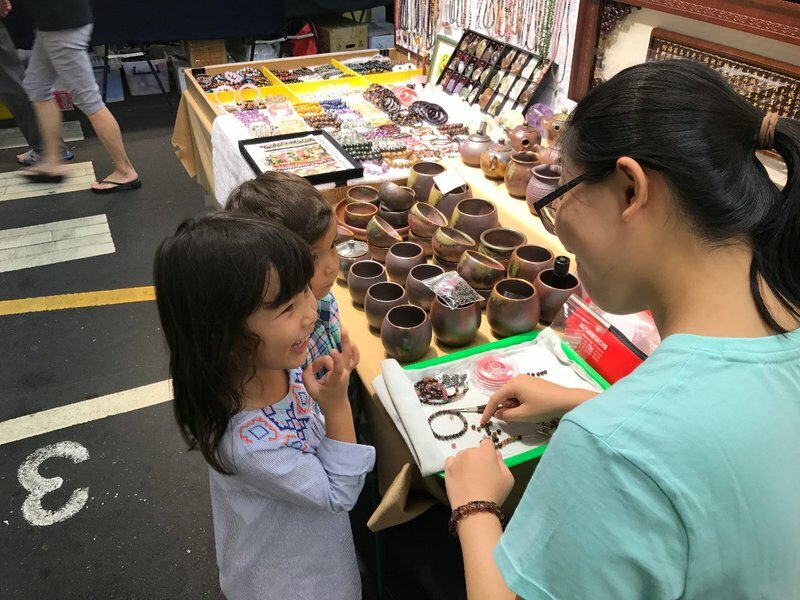 One of the first things Mei Ling asks me when I tell her about a city I want to visit is "Is there a night market?" All too frequently I have to tell her something like no, there's no night market in Cedar Rapids, Iowa. 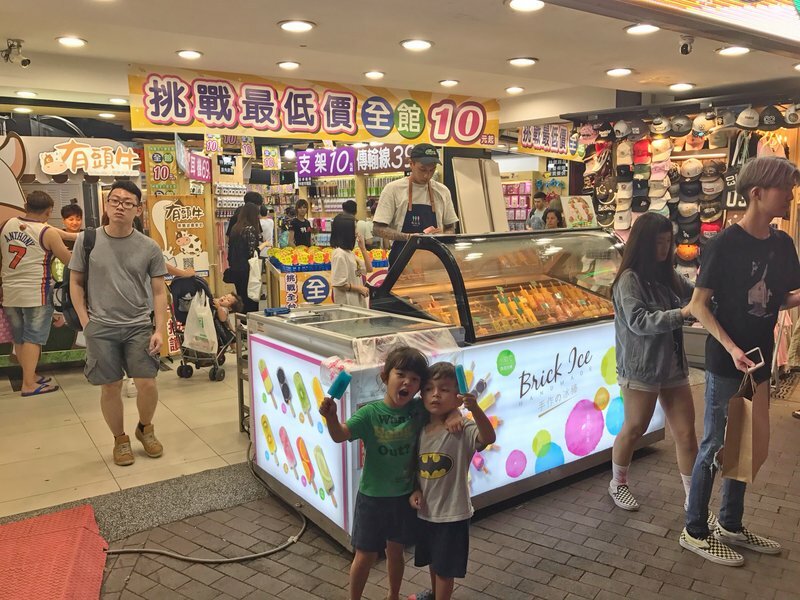 Fortunately for us, no city has elevated the night market into a pervasive cultural phenomenon like Taipei has. 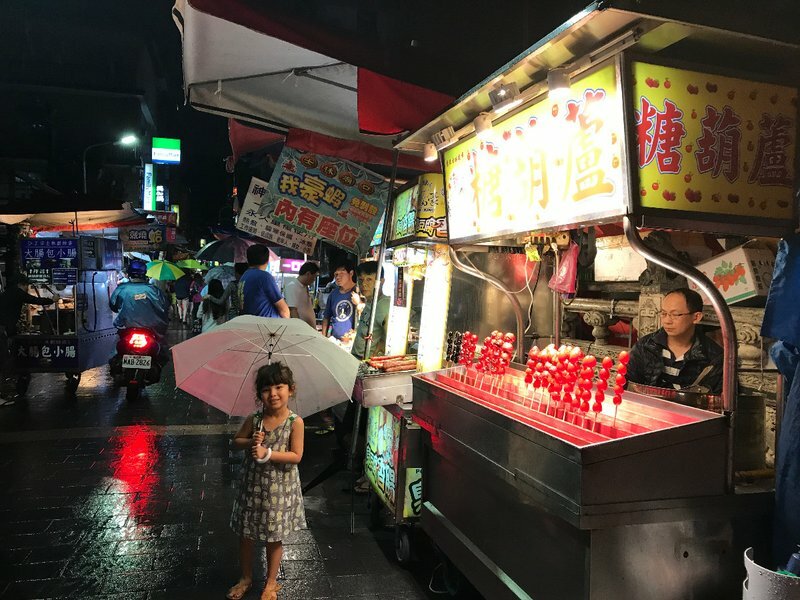 People go out at night to snack in Taipei the way Westerners go out to drink. 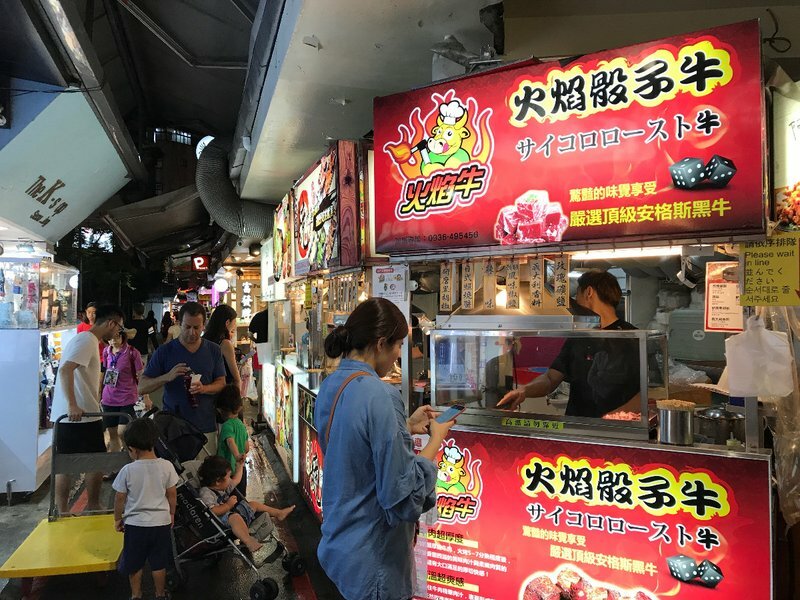 There are at least ten major night markets scattered around Taipei, but it's impossible to keep an exact count because of areas like Ximending which aren't thought of as night markets but have pedestrian zones packed with snack bars and street food. 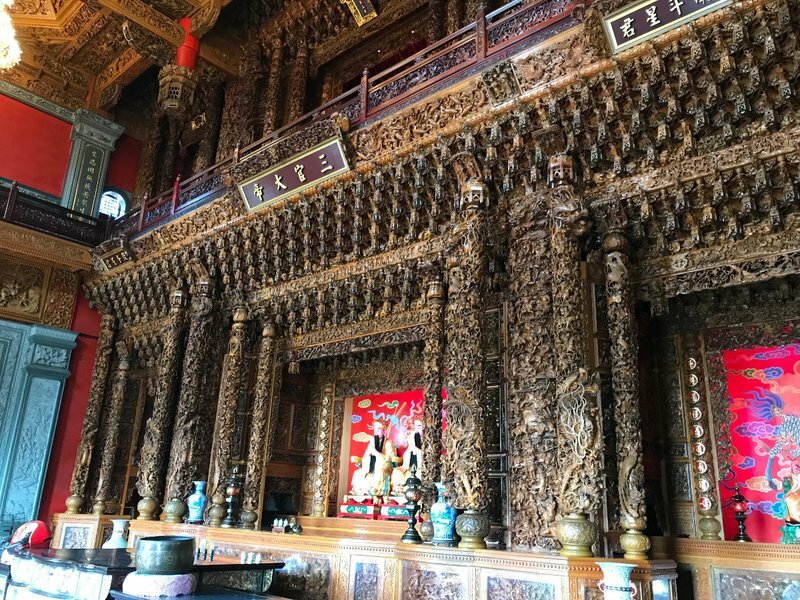 I compiled the most exhaustive list I could with big plans to visit all of them, but in the end we were only able to see three as well as Ximending. I'm not sure how much we missed though, as we saw a lot of same or similar dishes in all the markets. 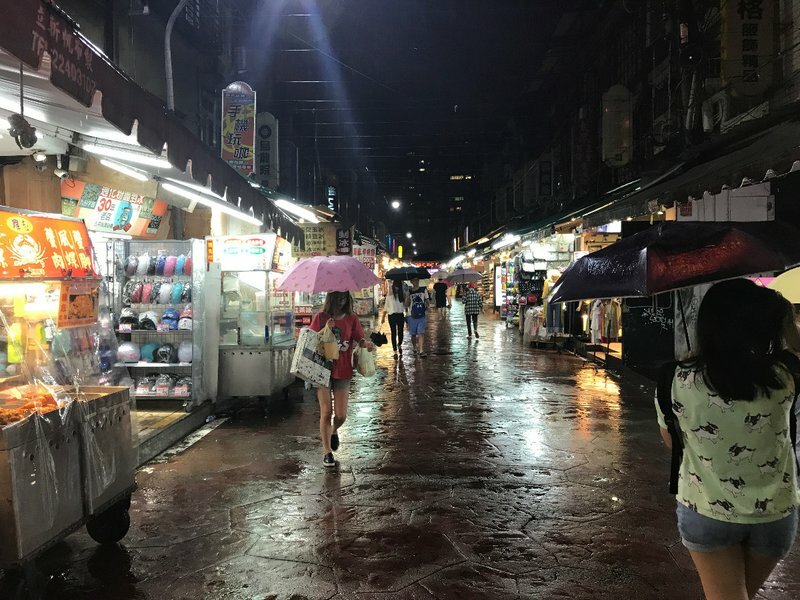 Most of the articles and blogs I read about the different night markets focused on their atmosphere or small differences in the prices, but we only encountered one atmosphere during our trip: rainy. 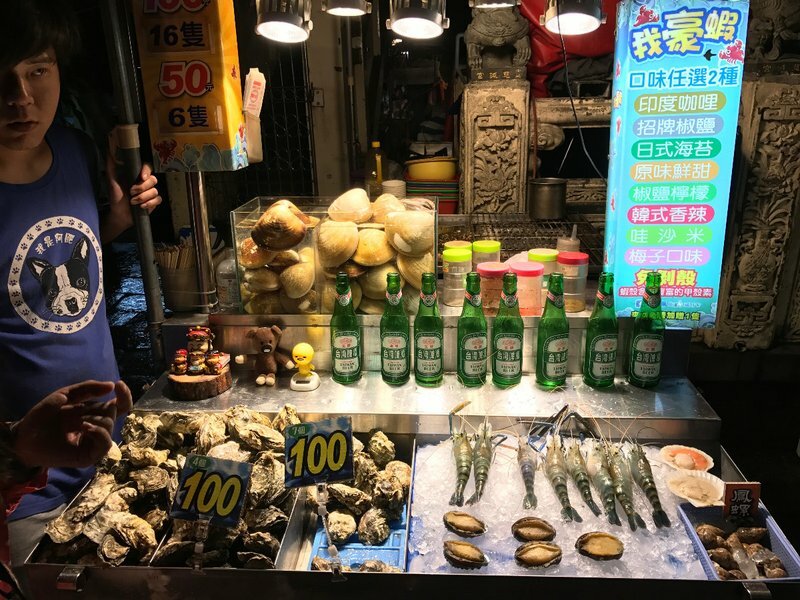 Our first genuine night market, and the only one we revisited, was in Shilin just north of the Keelung River. 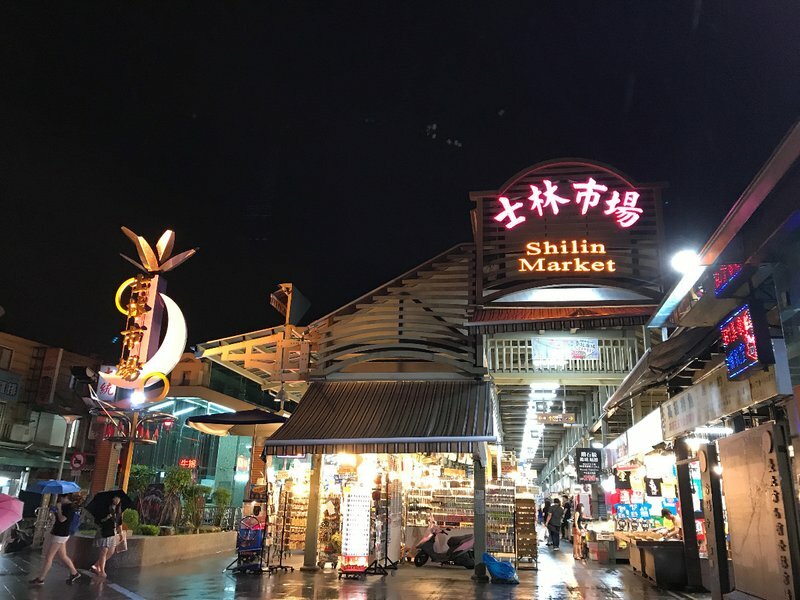 Shilin Market is the largest night market and has a reputation for being touristy. 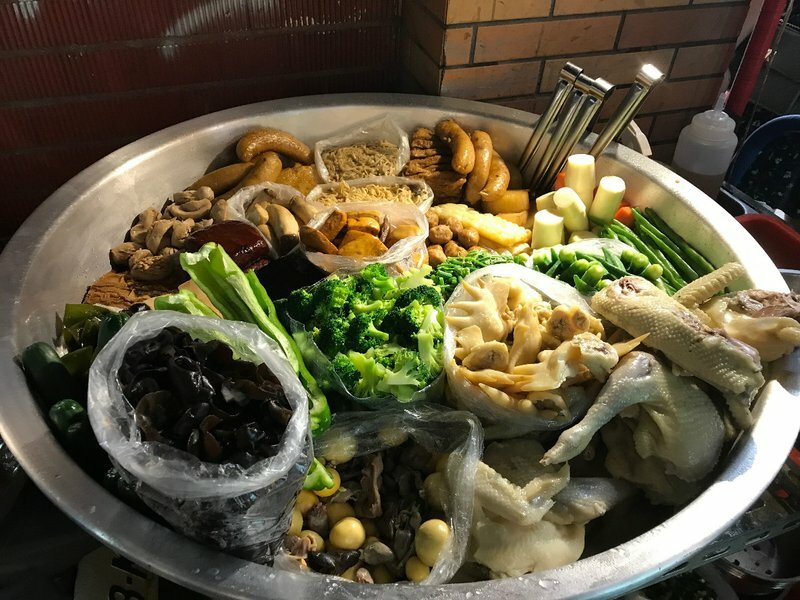 Even worse for the night market connoisseurs, it's considered to be expensive. However, dropping a few extra bucks wasn't much of an issue for us considering the amount we were already spending on our trip. 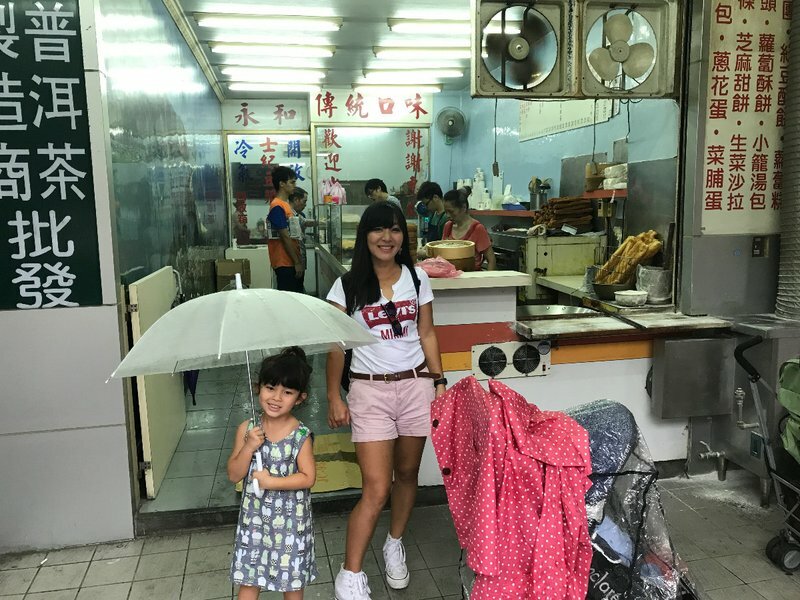 Shilin Market had the added advantage of being practically around the corner from Mei Ling's grandfather's apartment. Aside from the long outdoor night market, there was an indoor food court and a games arcade. 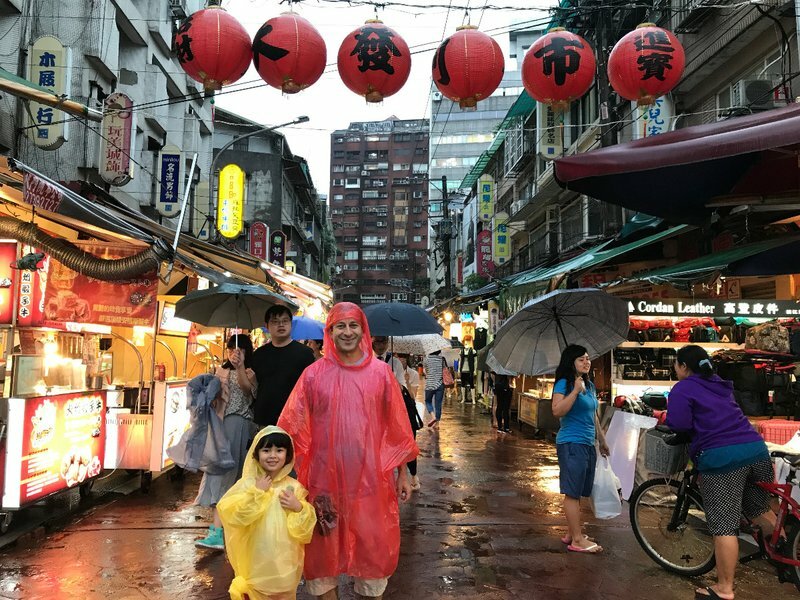 On our last night in Taipei it didn't rain and I got some good footage of the market with my iVUE Horizon video sunglasses, as well as an impromptu interview with one of the vendors who happened to be from the US. 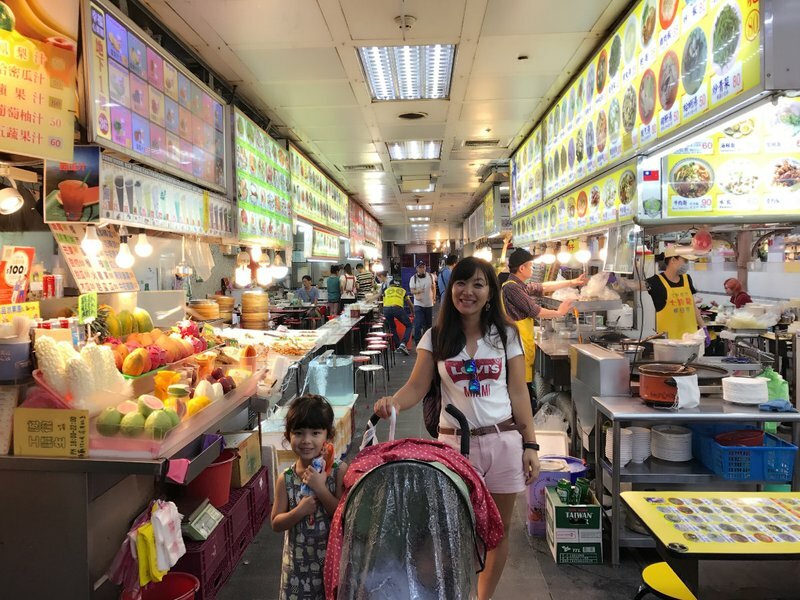 I can't say much about Tonghua night market except that it was conveniently located in central Taipei, within walking distance of Taipei 101. It was raining so much the night we were there I could hardly take any pictures. 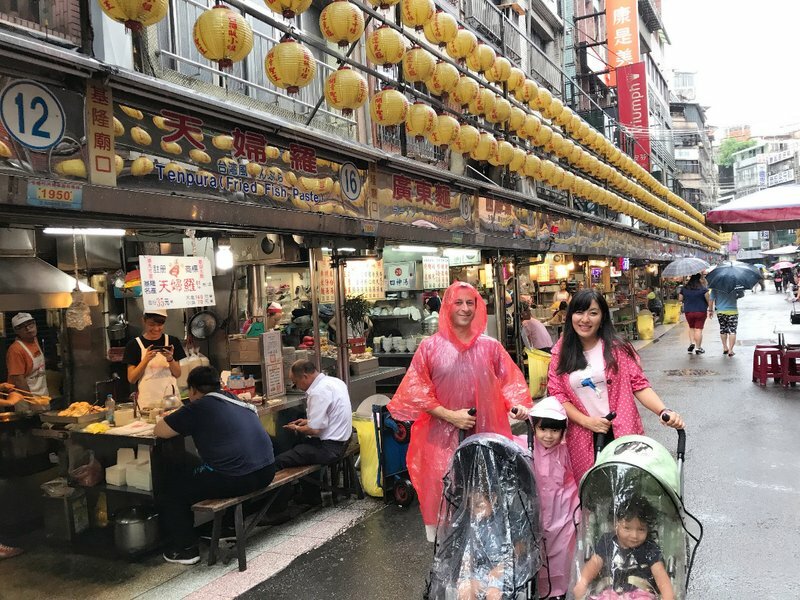 By this point we had experienced three days of almost continuous rain and I coined the term "Taipei personality" for anyone who would throw on a poncho and get constantly deluged rather than miss a chance to see a night market. 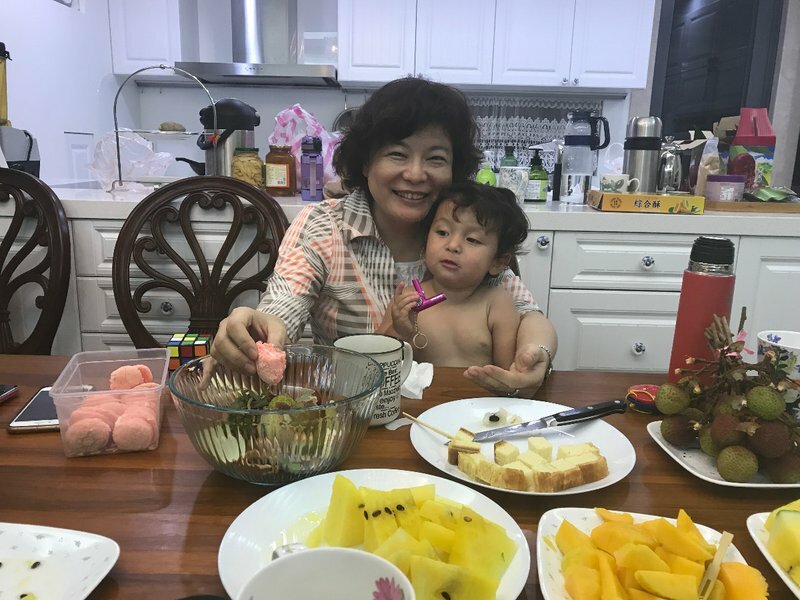 We were rewarded for our persistence with a huge platter of deliciously ripe yang mei. This is one of my favorite fruits, but unfortunately it's completely unobtainable outside of China and Taiwan. 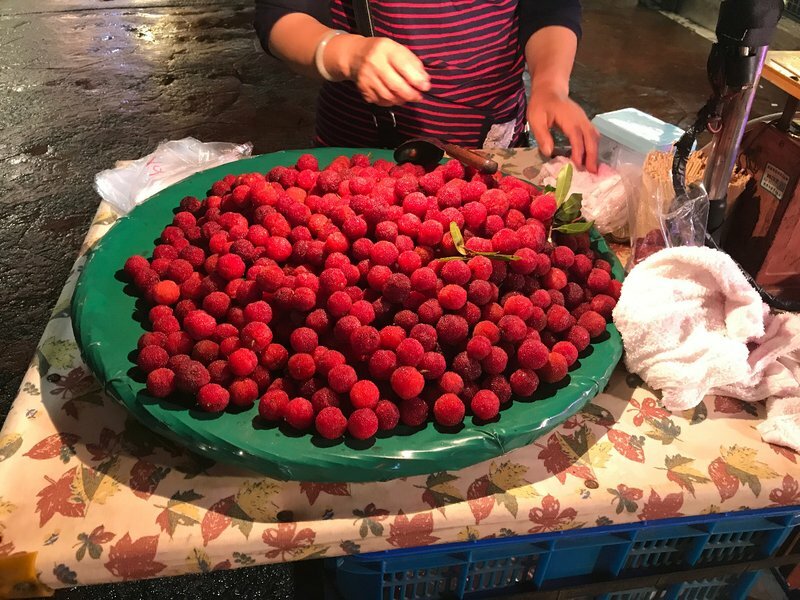 Aside from being practically unknown in other countries, the berry is so fragile that it's impractical to transport overseas. Just a slight bruise and the fruit immediately starts to acquire an unpleasant fermented taste. 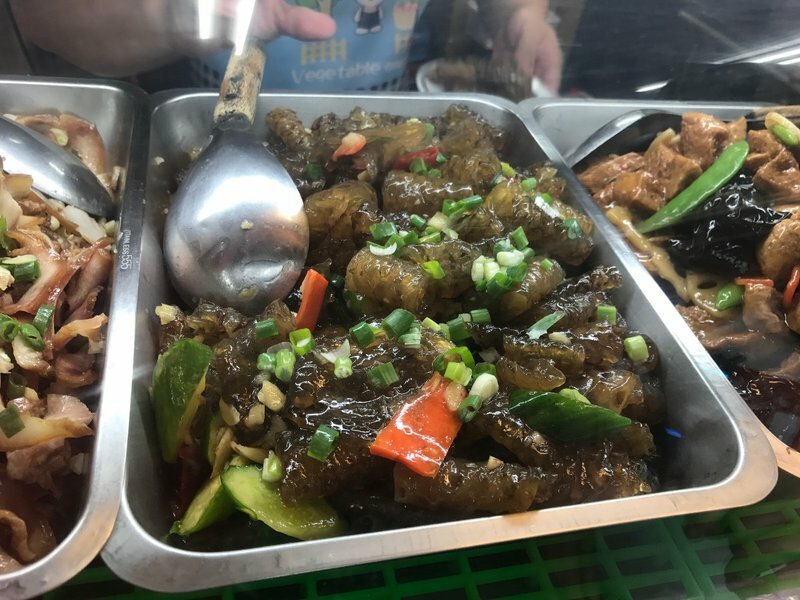 The opportunity to eat fresh yang mei is one of the treats I look forward to when I visit China. 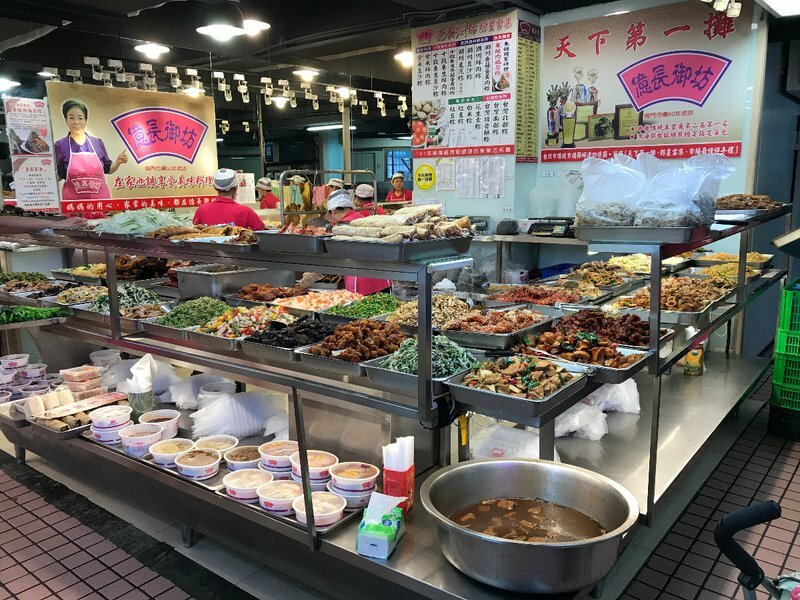 Raohe is the second biggest night market after Shilin, and many people consider it to be the best. 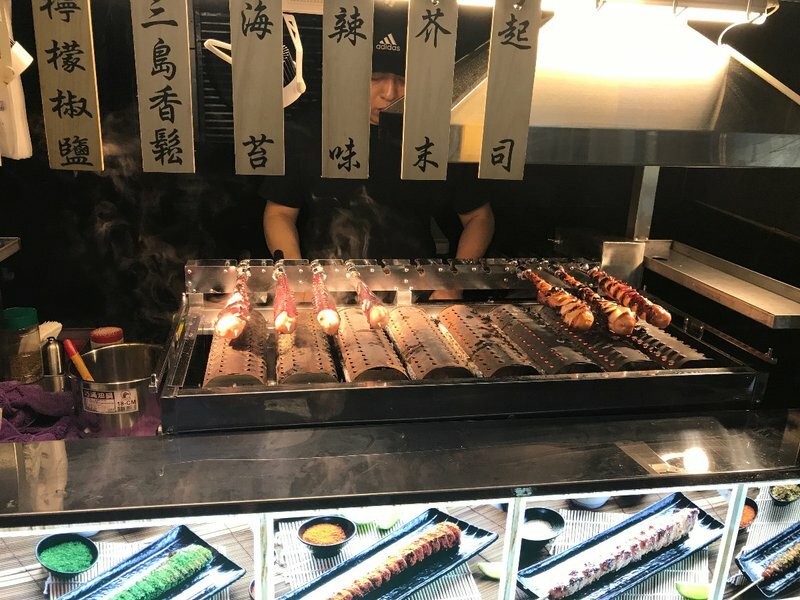 We particularly enjoyed the wide selection of fishballs and meatballs as well as barbecued shellfish. Cleo was amazed by the liquid nitrogen which spilled from the ice cream stand and made clouds around her feet. 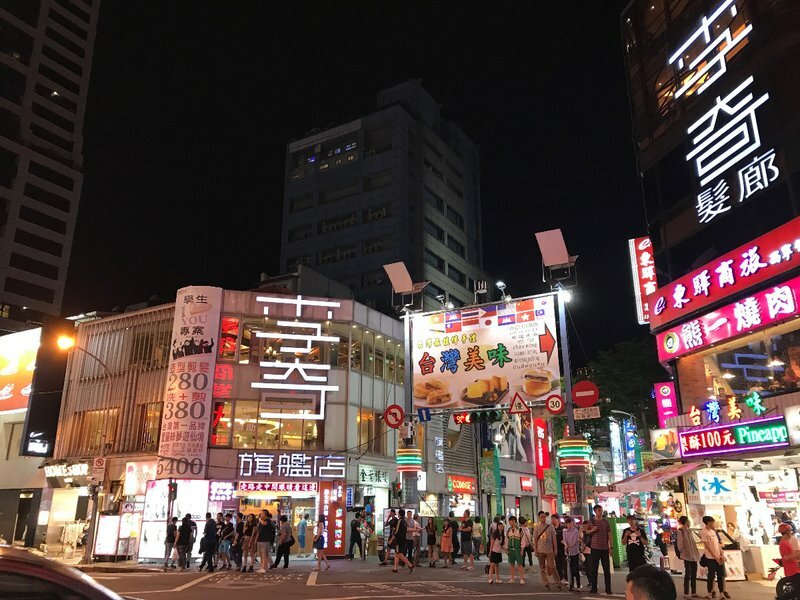 You won't find a mention of Ximending in any article about Taipei night markets, but in its own way the whole neighborhood is the biggest and most vibrant night market of them all. 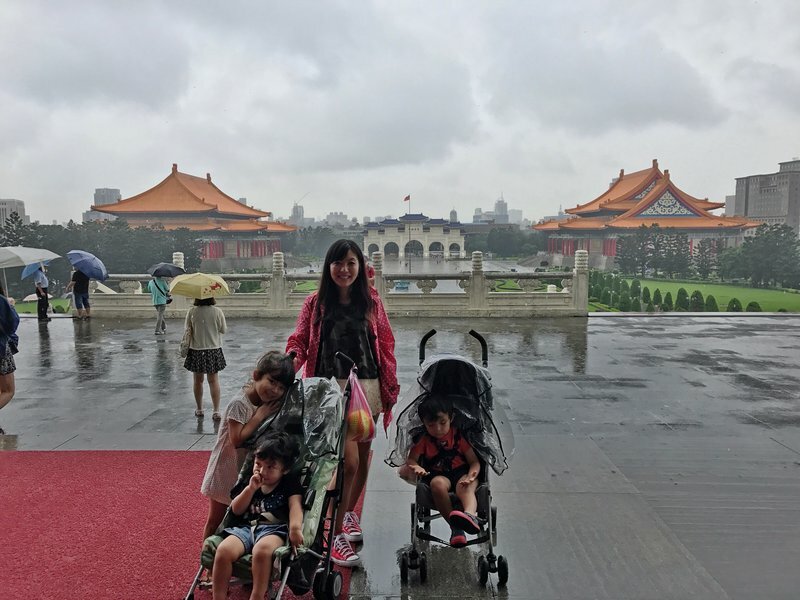 It was without question the best part of Taipei we could have chosen to begin and end our days. 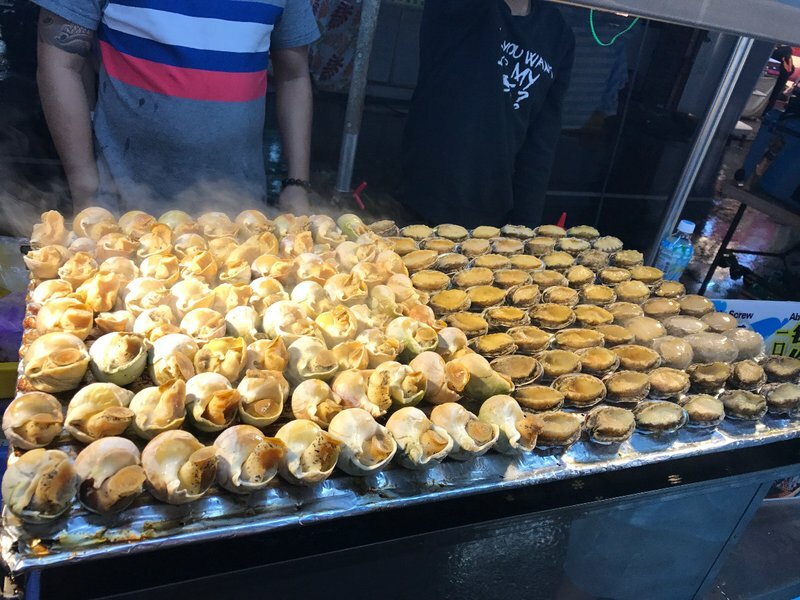 Despite regular attendance at the night markets, I never did become an expert on Taipei street food. 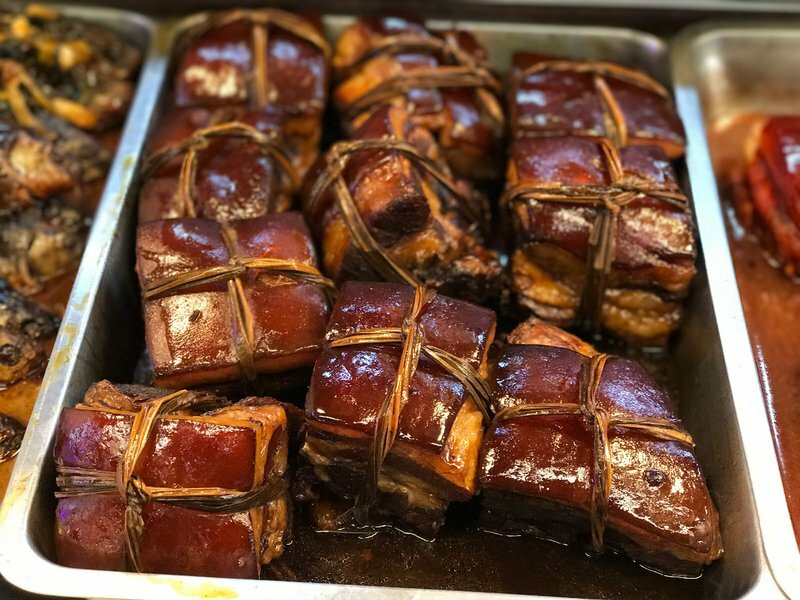 I included a couple more helpful guides to some of the favorite dishes here and here. 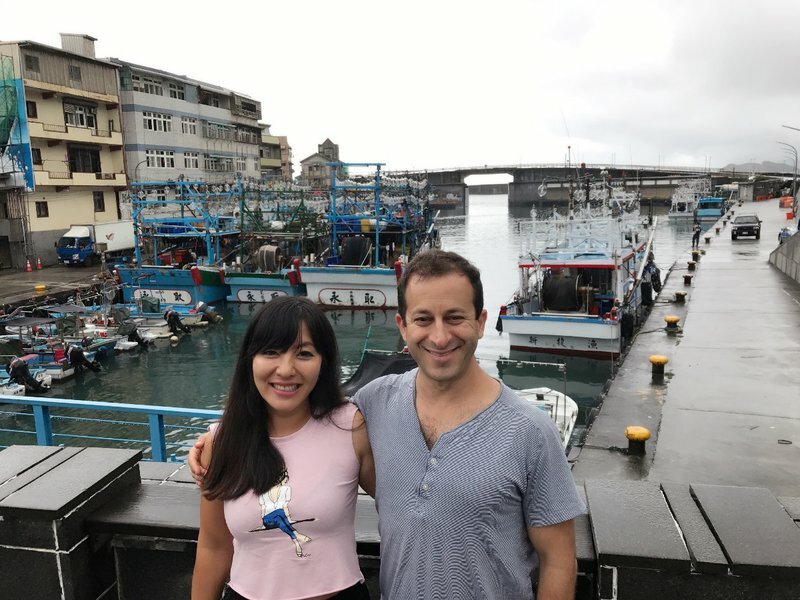 We had great experiences in Tokyo and Seoul on our last two round-the-world trips, so we decided to stop in a major East Asian capital this time as well. 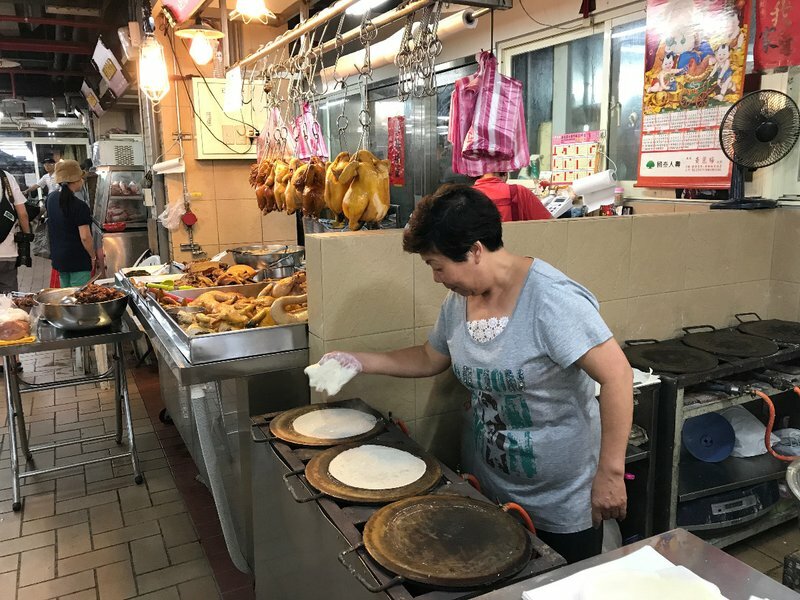 The two things that brought us to Taipei were the city's reputation as a food and market mecca and the presence of Mei Ling's beloved elderly grandfather, who she hadn't seen in many years. 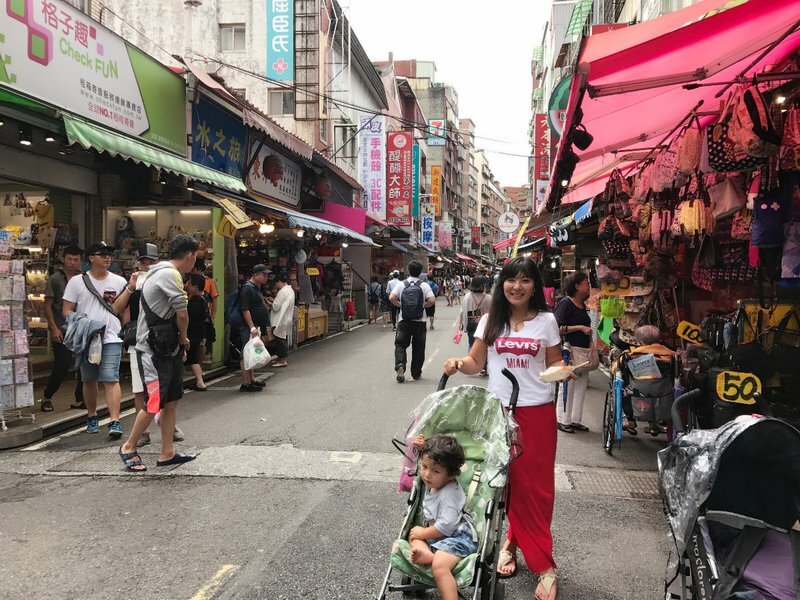 We allotted a full week to experience the many famous night markets and give Mei Ling plenty of time to reconnect with her family. The fifteen hour flight from NYC was tough but not excruciating, as the kids slept for a decent portion of it. I only slept about an hour but I was high on the adrenaline of arriving in a new country and major city. 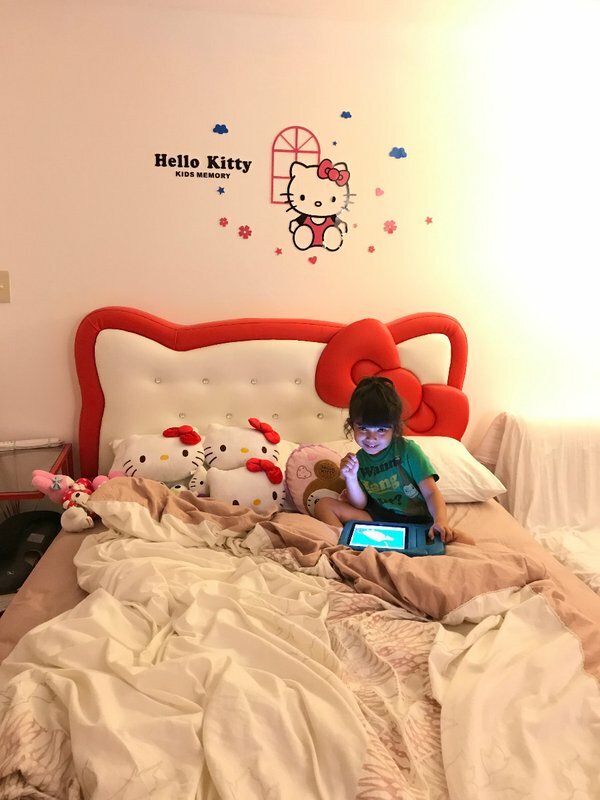 Oddly enough, we were staying in a Hello Kitty Airbnb much like the one we'd stayed in in Seoul. 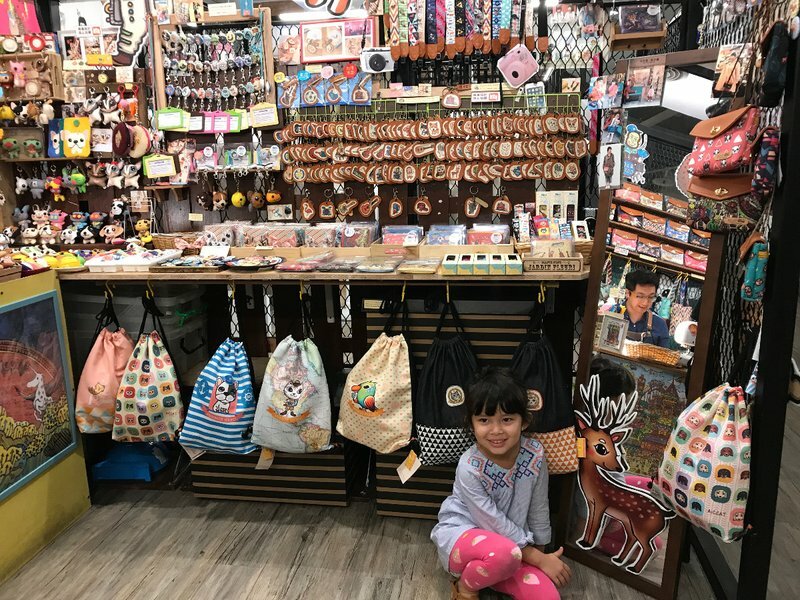 I didn't have any particular affinity for Hello Kitty, but it was the best place I found and it seems to be a fairly common theme in East Asia. 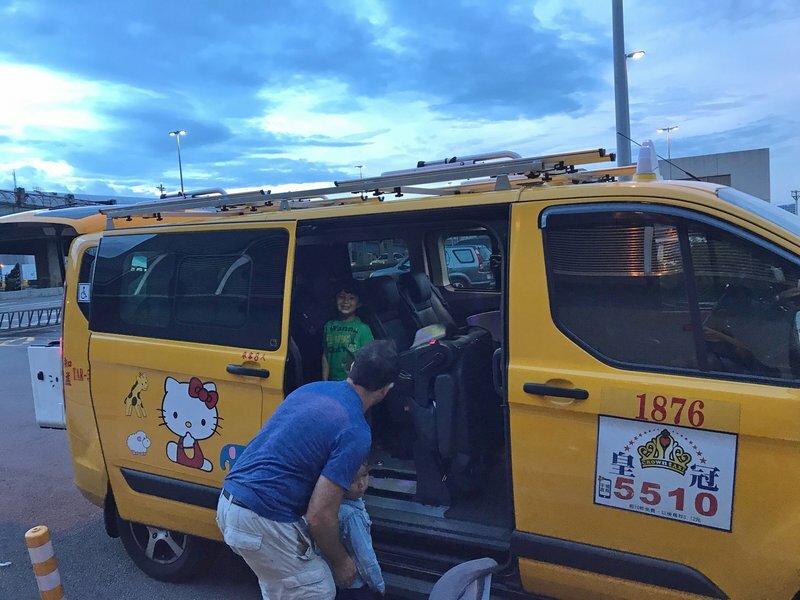 The hotel sent over a Hello Kitty van to pick us up at the airport and take us back to our room. 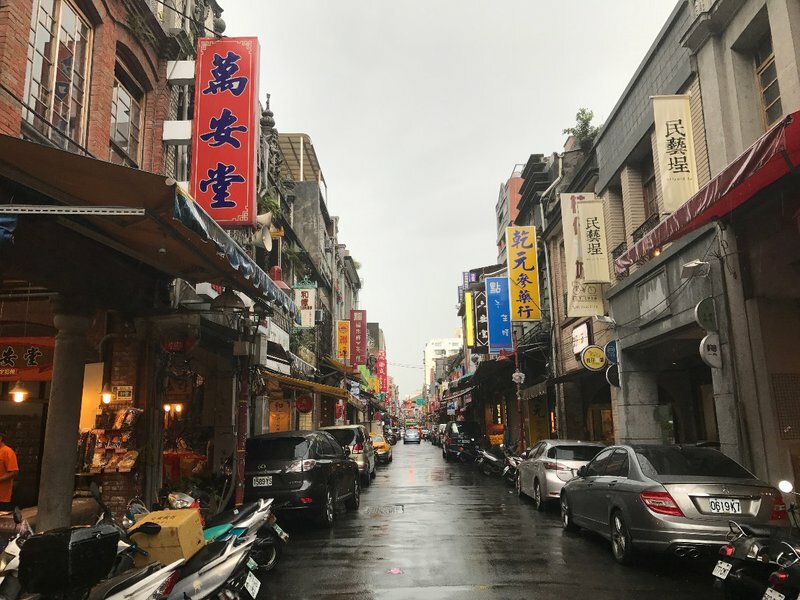 We had chosen the throbbing commercial neighborhood of Ximending in the center of Taipei. 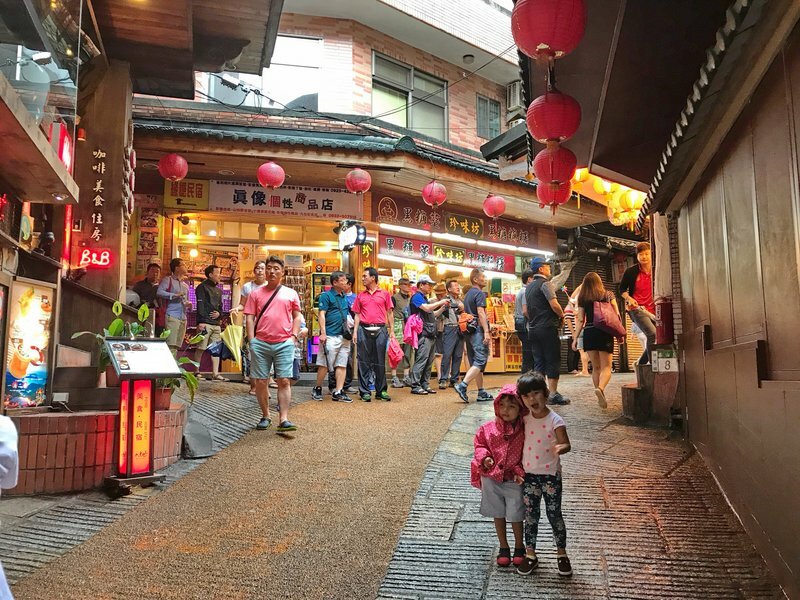 The area didn't have its own named night market, but we would never have known it walking around the pedestrian zone on our first night. The entire area seemed to be one giant night market with neon signs and billboards everywhere we looked. And naturally, exotic and delicious food was all around us. After gorging ourselves we stumbled on a couple of street acrobats in an open space in the pedestrian zone. This was no ordinary event, as the performers were obviously highly skilled. 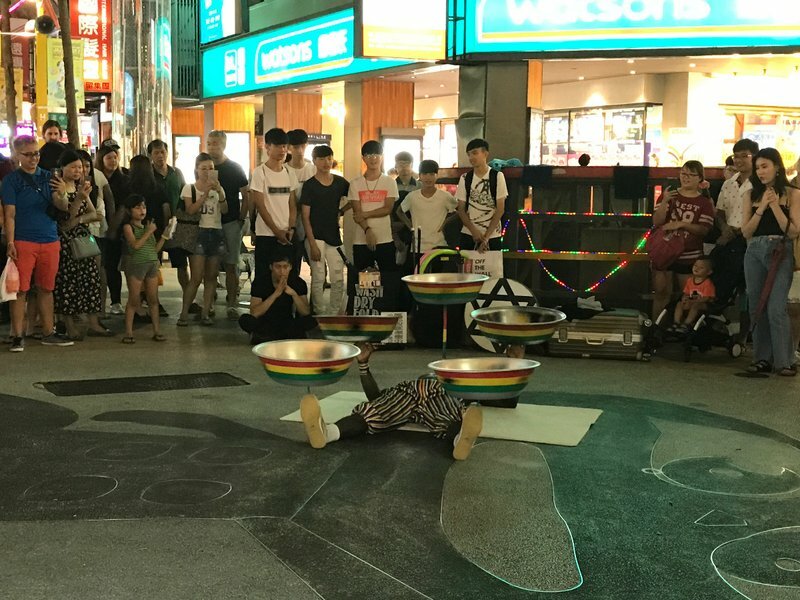 In fact, we later learned that one of them was the famed Taiwanese acrobat Isaac Hou who has been featured in commercials for Chase bank. 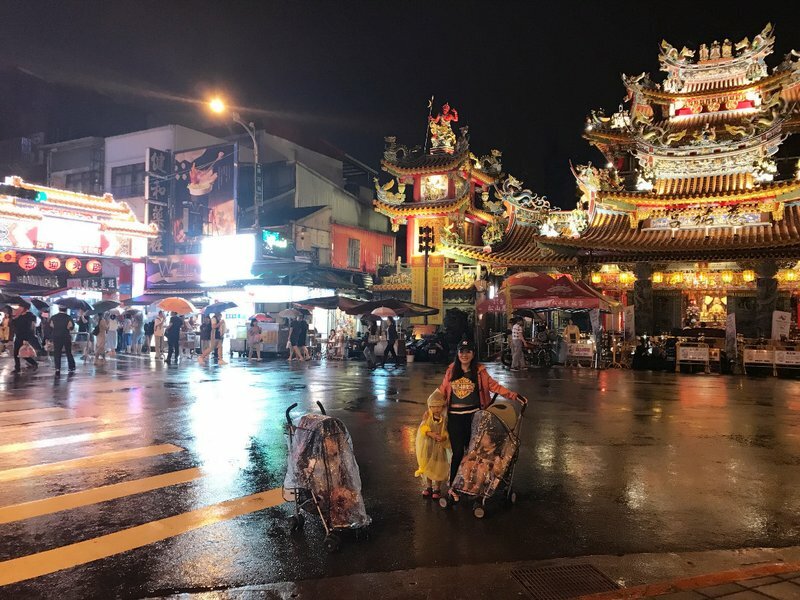 Our first night turned out to be one of the few moments we experienced in Taipei without rain. For the rest of our week-long stay it rained almost continuously. We didn't have the time to stay inside to wait for the rain to stop, which it almost never did anyway. 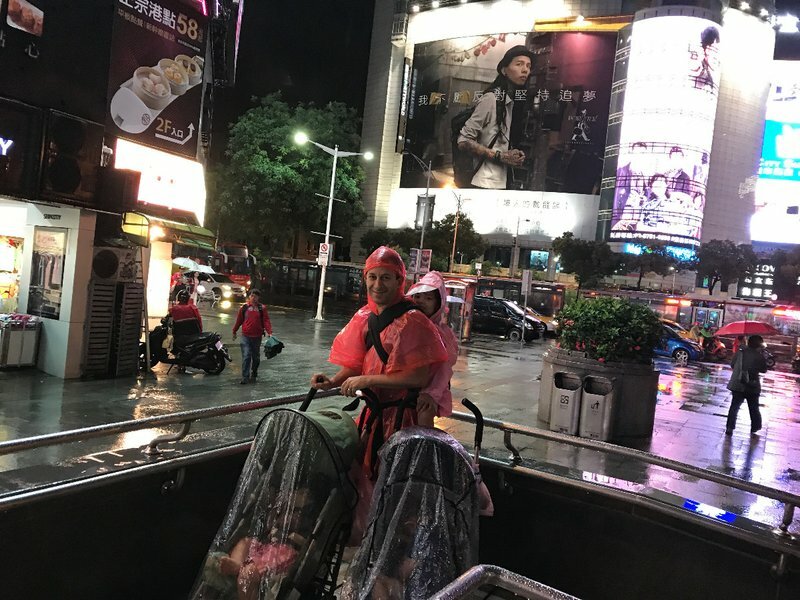 We bought the older kids raincoats and used plastic covers on the strollers. For ourselves, we had the cheap plastic bag ponchos that we could scrunch up and stuff into our pockets when we were indoors. 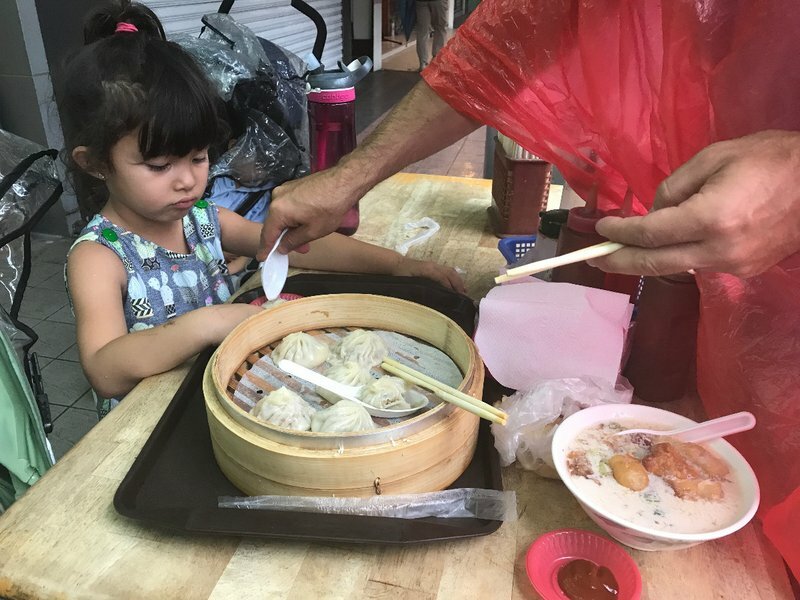 On our first full day we snagged breakfast at a series of classic Taiwanese sidewalk dumpling and noodle shops in Ximending. Every time we decided we'd had enough we'd run into another irresistible delicacy a block down the road. 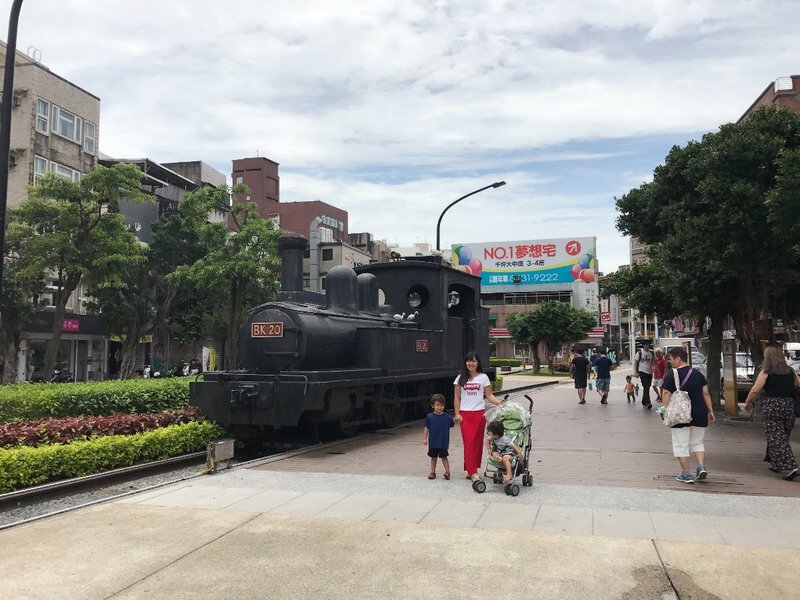 We took the highly efficient Metro to Dihua Street in the northern neighborhood of Dadaocheng. 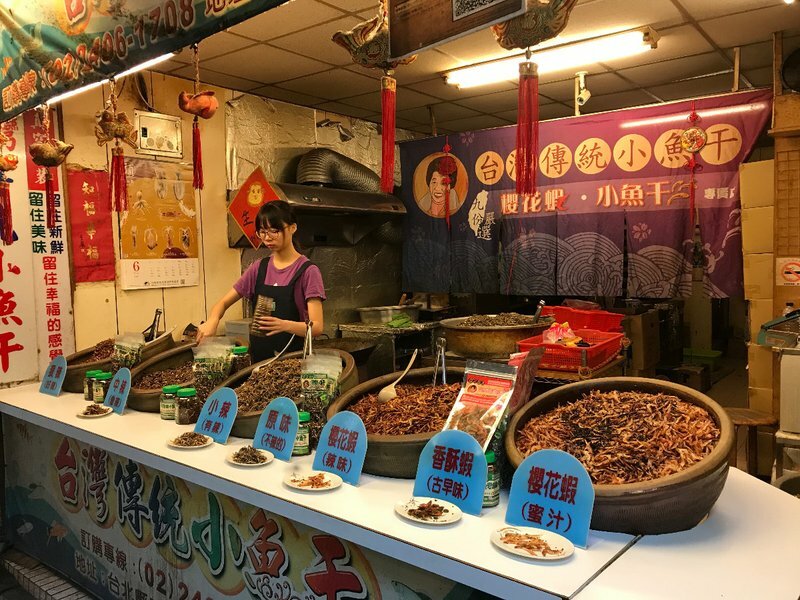 Dihua Street is believed to be the oldest street in Taipei and is famous for dried foods and Chinese traditional medicine. We spent about an hour walking up and down the street enjoying the sights and smells of the preserves. 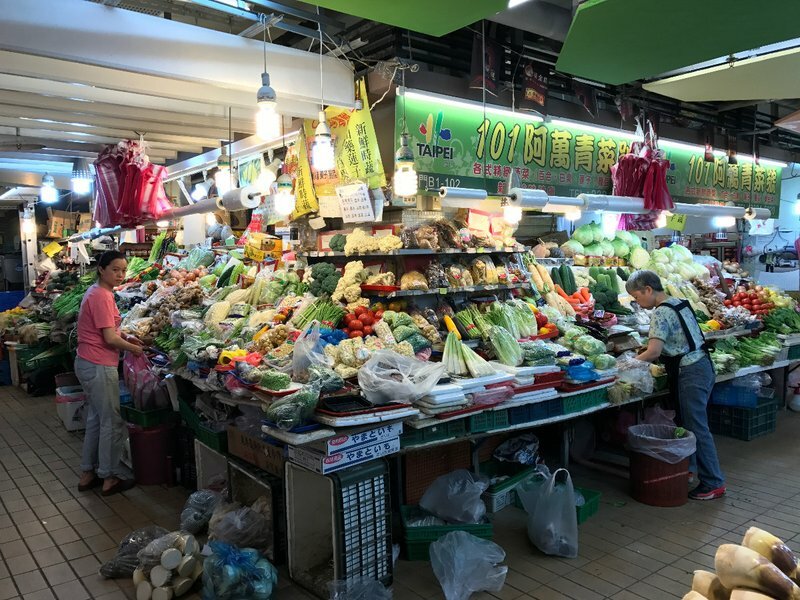 Day or night, it's impossible to walk far in Taipei without stumbling on a market and soon enough we found ourselves inside a major one in Dadaocheng. The kids were fascinated by a lady artfully making thin pancakes on a gas cooktop. 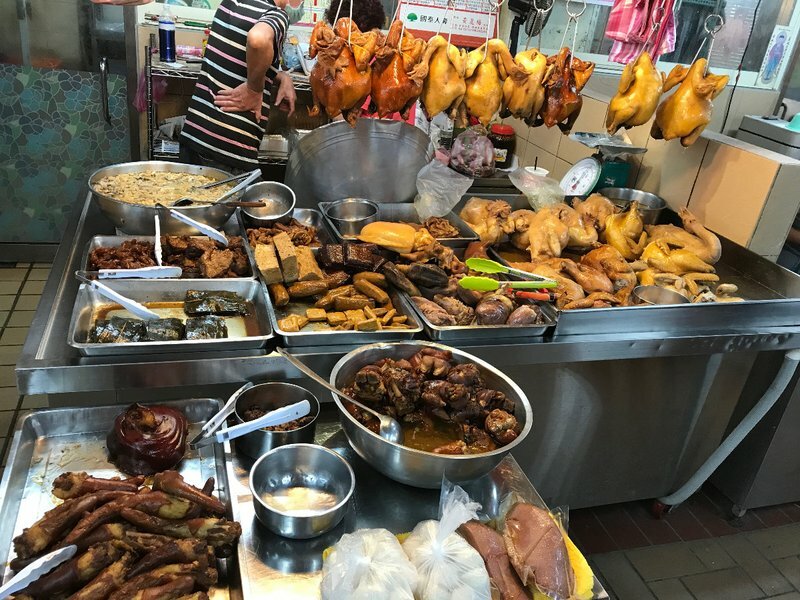 It was only two hours since we'd had breakfast, but we still found room to consume a selection of delicacies we found at the market's food court. 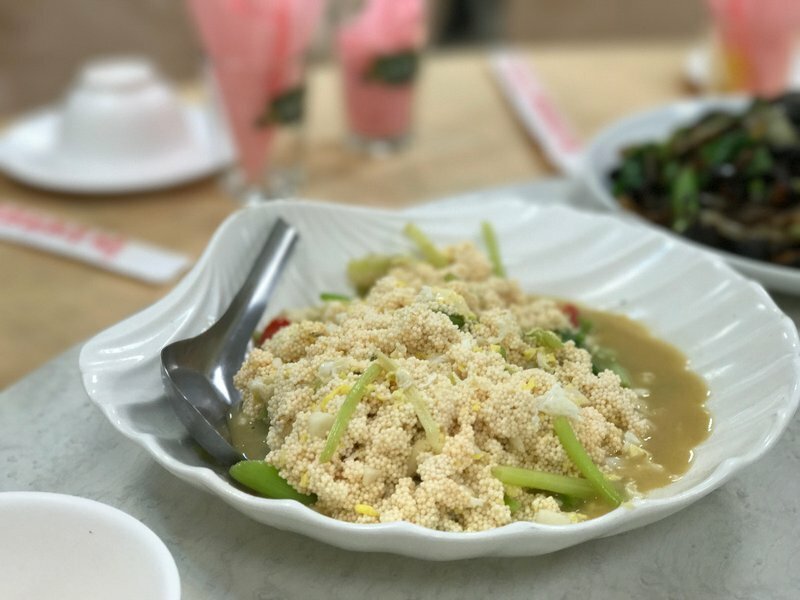 My favorite was the fish skin salad, although the skin was somewhat thicker and less crispy than the first one I'd tasted in Guangzhou two years earlier. 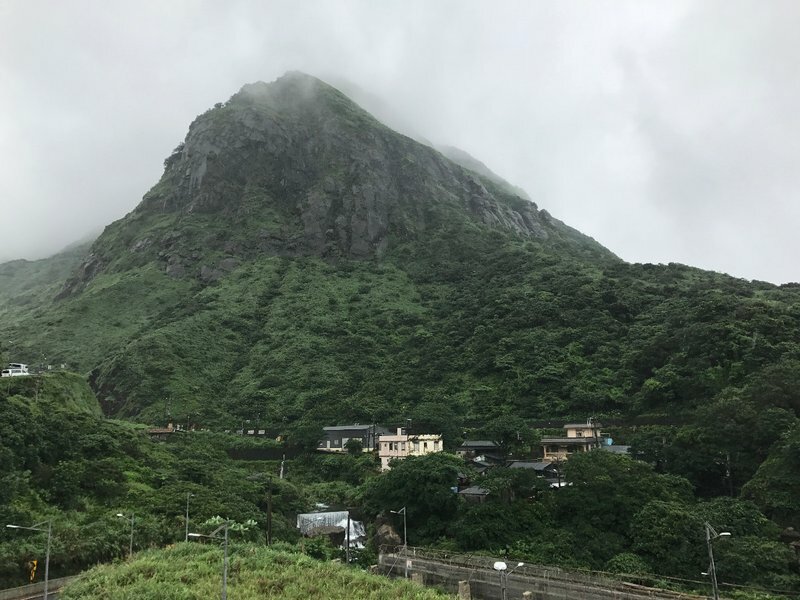 We returned to the Metro which took us to Mei Ling's grandfather's apartment in the Shilin district, north of the Keelung River. 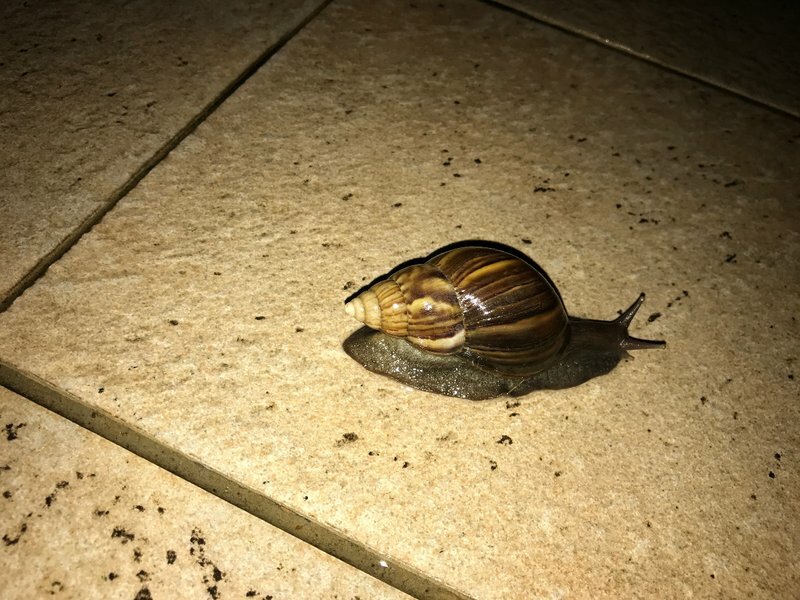 Interestingly, the sidewalks of the apartment complex were full of huge African land snails. Perhaps the incessant rain had driven them out of their usual habitats. After a couple of hours of reconnecting, we went out for our first real restaurant meal of the trip which was relatively boring compared to the street and market food we'd been eating over the last 24 hours. 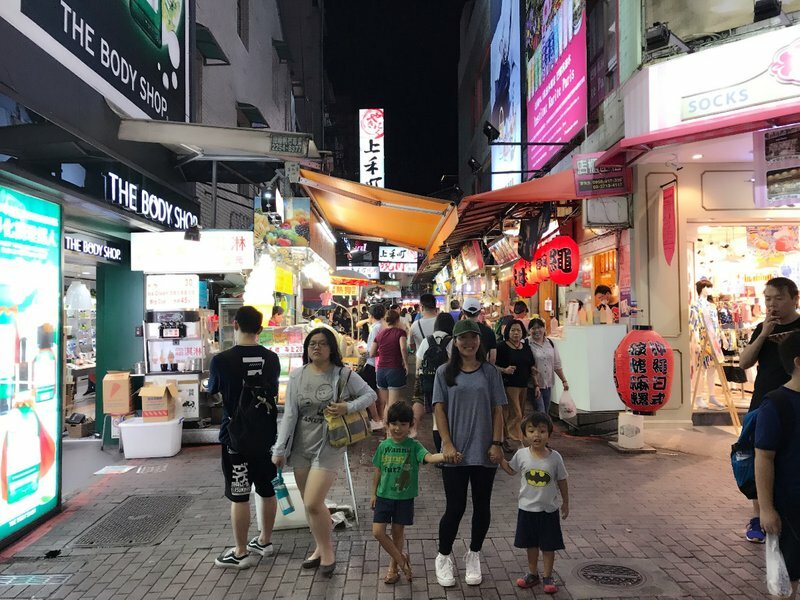 Once Mei Ling was finally ready to leave her family, it was just a short walk to the Shilin night market. 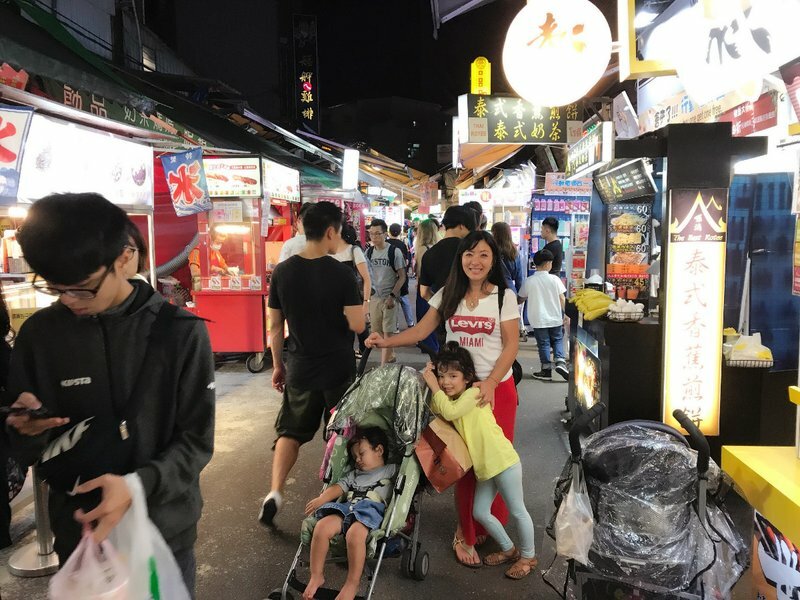 Taipei's night markets are one of the most amazing and unique features of the city. There are at least a dozen scattered around the city and most are open every night. 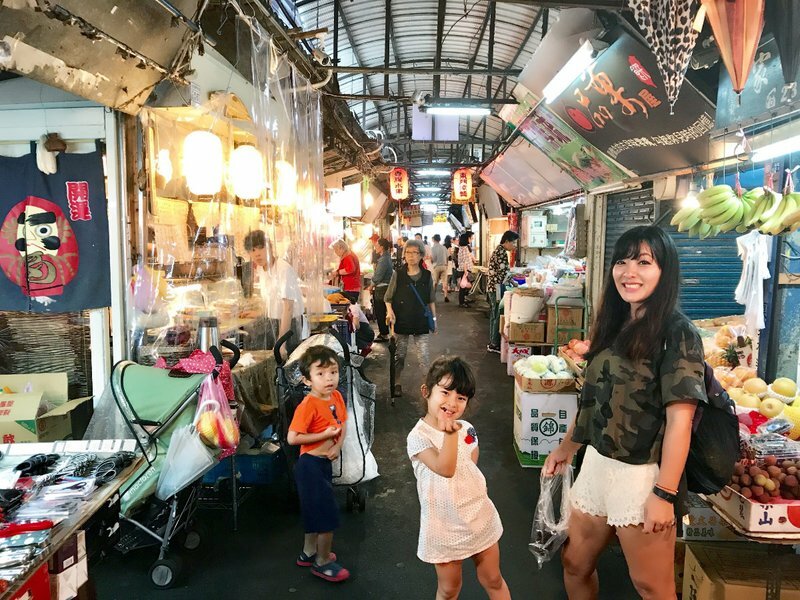 The experience of walking through a night market is overwhelming, with a seemingly endless array of booths serving the favorite local snacks. 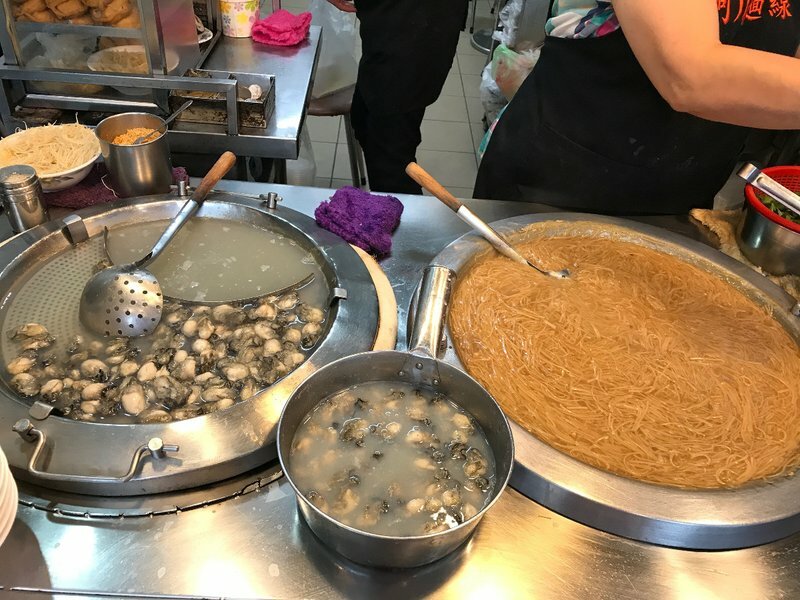 Since there's so much to describe regarding the night markets we visited, I decided to group them together in a separate post. 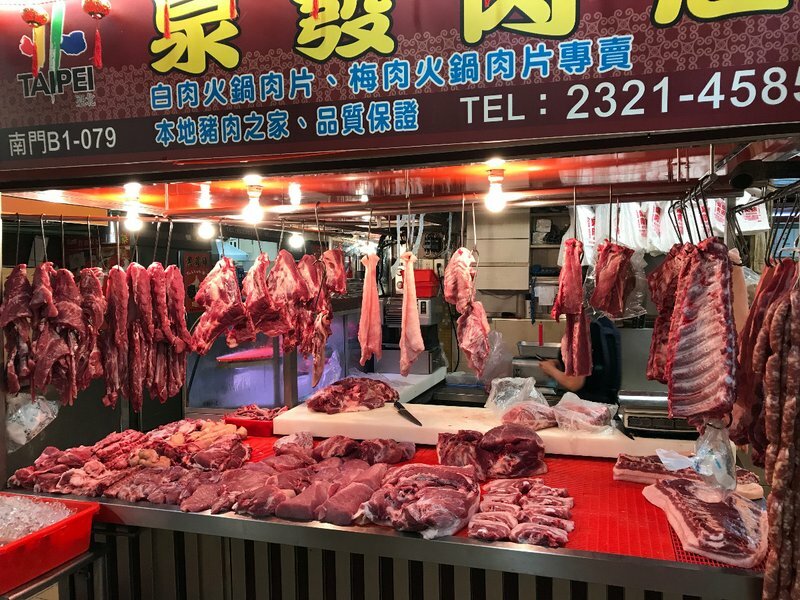 On our second full day we decided to check out a couple of the larger morning markets in the center of the city, Nanmen and Dongmen. 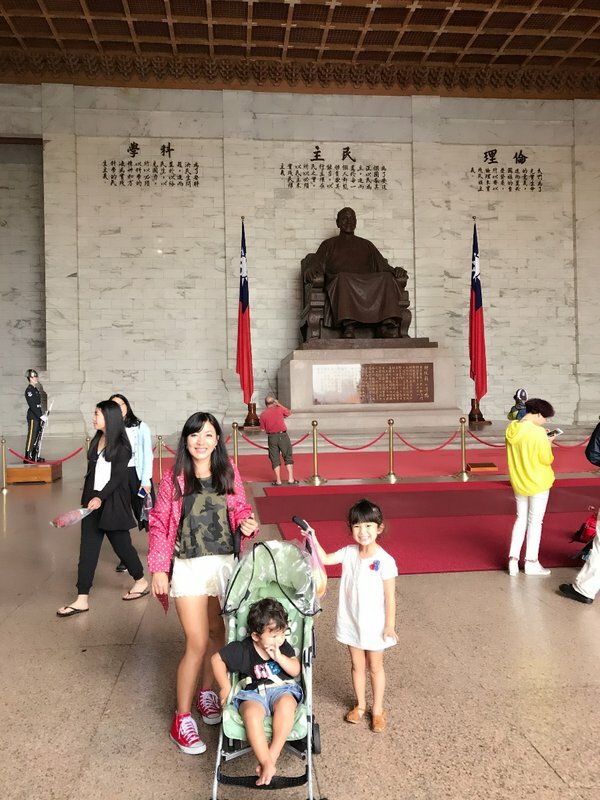 When we got out of the Metro we found ourselves just outside of Liberty Square, home of the Chiang Kai-shek Memorial Hall. 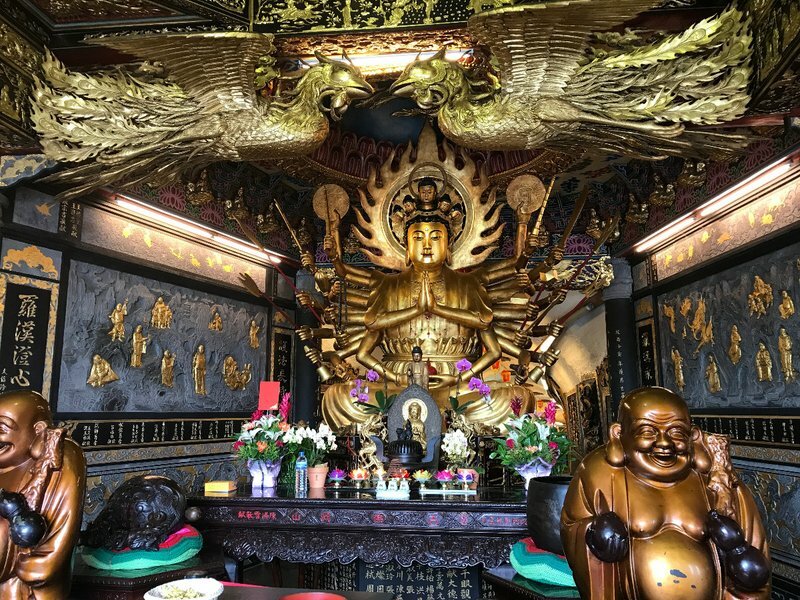 This is one of Taipei's main tourist attractions, but not the type of place we usually seek out when we travel. 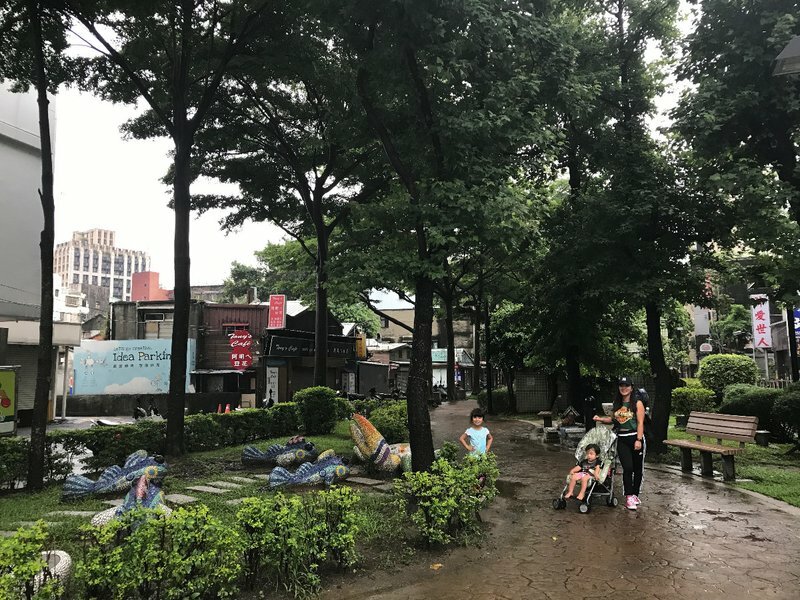 Since we were there anyway and we'd already eaten breakfast in Ximending, we decided to take a look around. Fortunately we didn't have to climb the 89 steps, representing Chiang's age at the time of his death, to the main entrance. On the ground level there was a small museum and an elevator to the main hall. 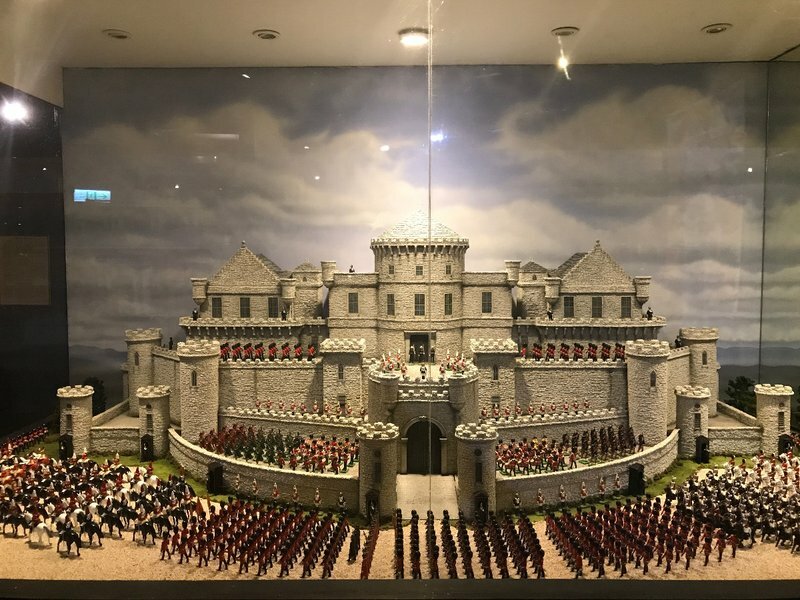 The building contained the expected collection of dry historical artifacts and a towering statue of Chiang Kai-Shek. I don't think we would have missed much if we'd decided not to go inside. 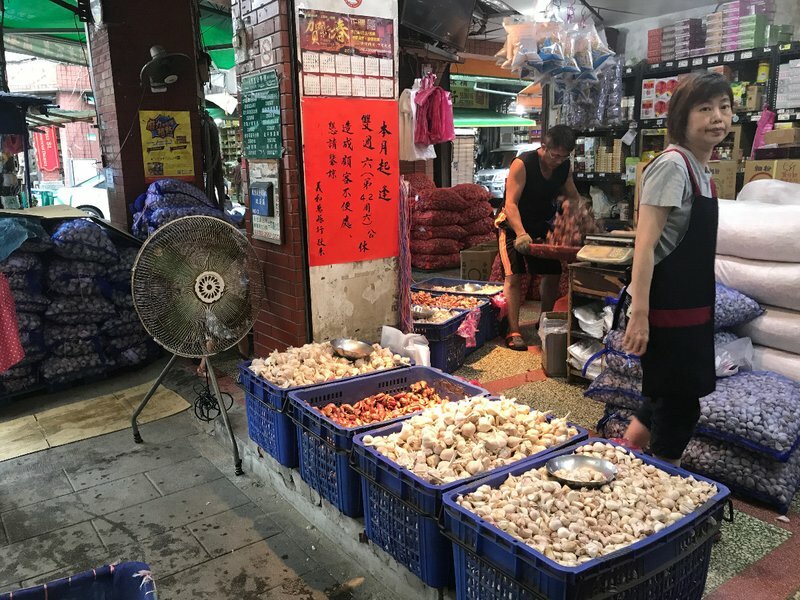 The morning markets were quite large and energetic, especially Dongmen which was labyrinthine. 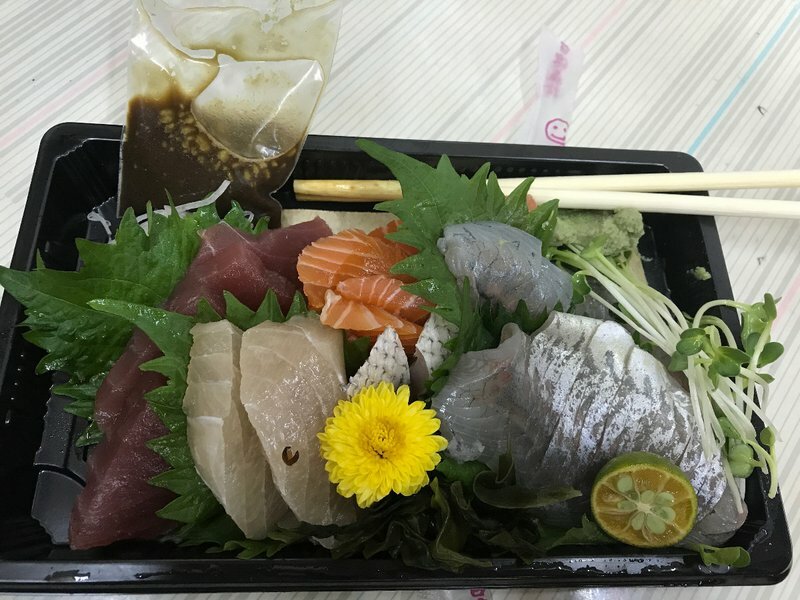 We put together a great lunch at the food court at Nanmen and topped it off with sashimi at Dongmen that was so fresh it glistened. 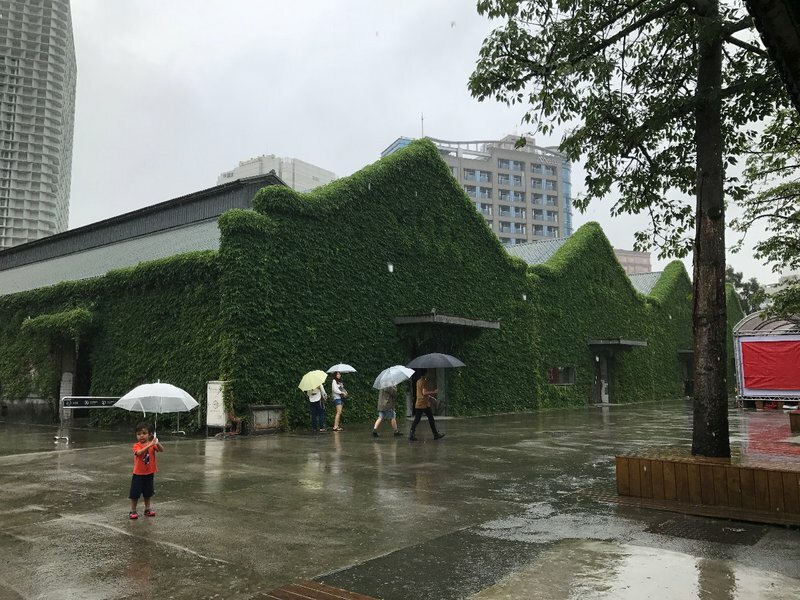 We took a long walk to Huashan 1914 Creative Park, a collection of galleries, stores, and performance spaces housed in an abandoned factory complex. 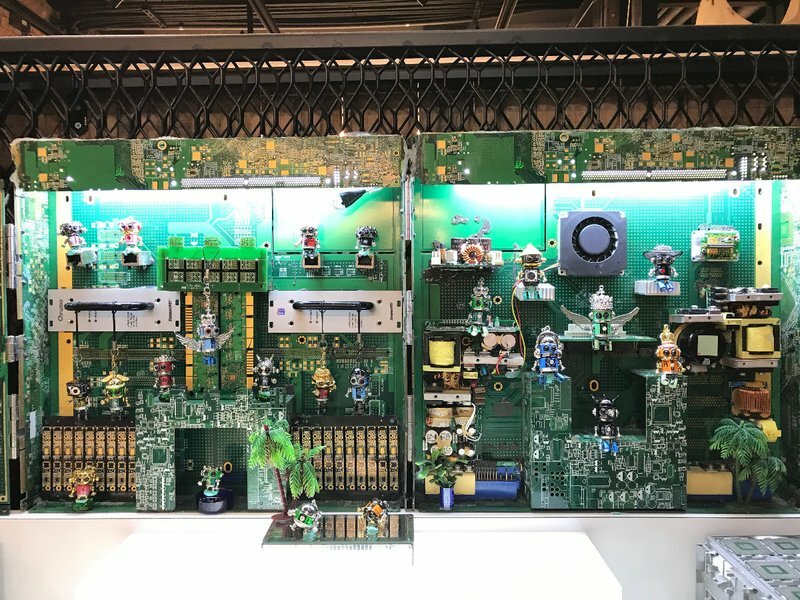 It was an interesting place, but not on the level with other reclaimed art communities that we've seen so we didn't stay long. 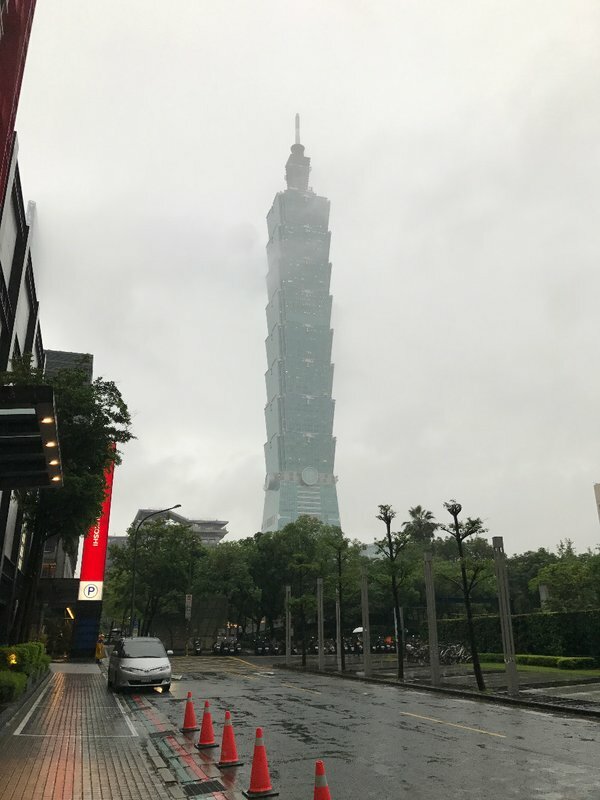 Our next stop was Taipei 101, which was the tallest building in the world from 2004 to 2010. The skyscraper has a unique segmented design meant to evoke a stalk of bamboo, and is famous for the enormous steel pendulum suspended amid the upper floors. The pendulum acts as a mass damper to offset swaying caused by wind gusts. Because the weather and hence the visibility were so bad, we decided not to waste time and money standing on line for the elevator to the observation deck and therefore missed seeing the pendulum as well. Taipei 101 is surrounded by an enormous multilevel network of malls as well as the requisite basement food courts. After exploring for a couple of hours and letting the kids try out most of the displays at a toy store, it was time for dinner. 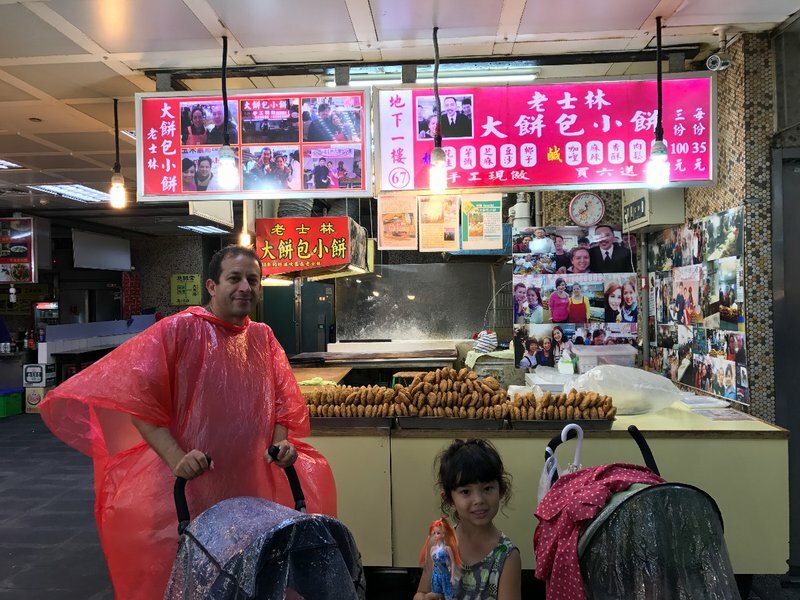 Fortunately we were within walking distance of the Tonghua night market, which we had to hurry through as the incessant rain had strengthened into a downpour. 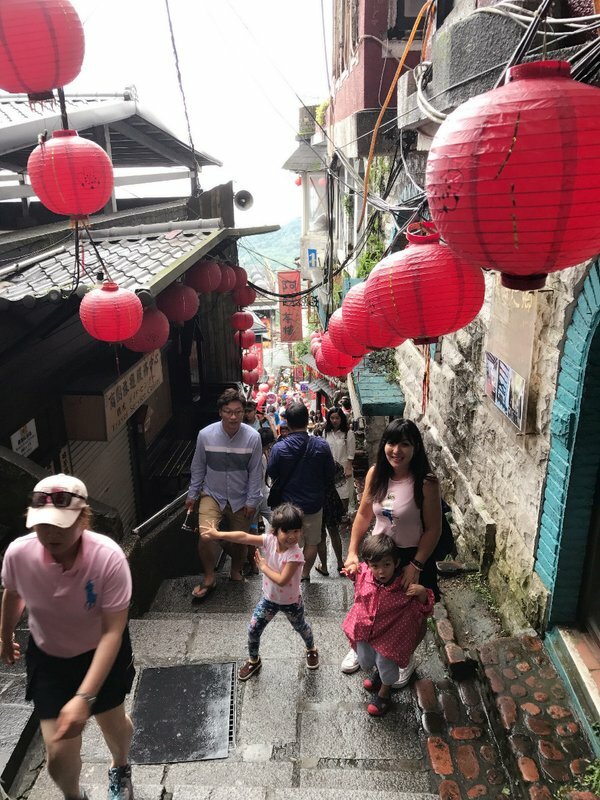 We spent the entire day Friday on a road trip to Jiufen and Keelung which I'll cover in my Taipei day trips post. 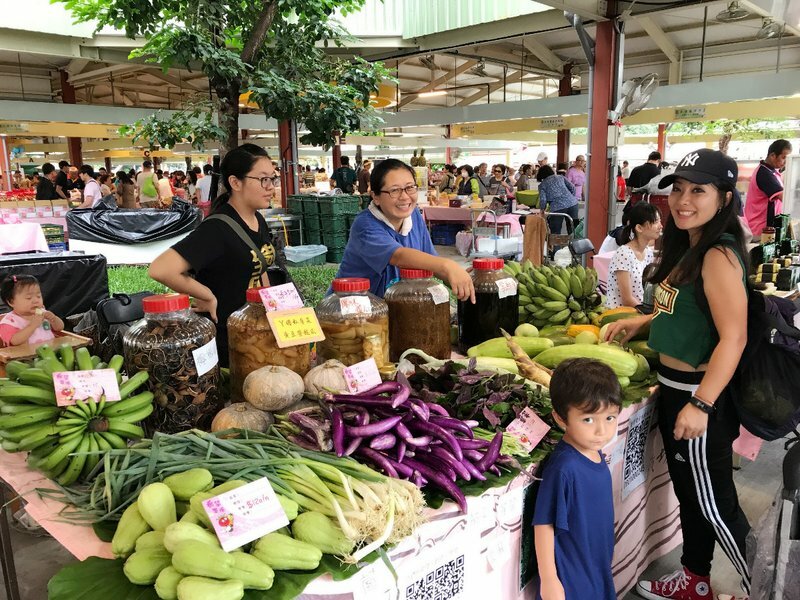 On Saturday we started the day with breakfast at the Qingguang morning market in the central Zhongshan neighborhood, then walked south to the Hope Plaza Farmers' Market. 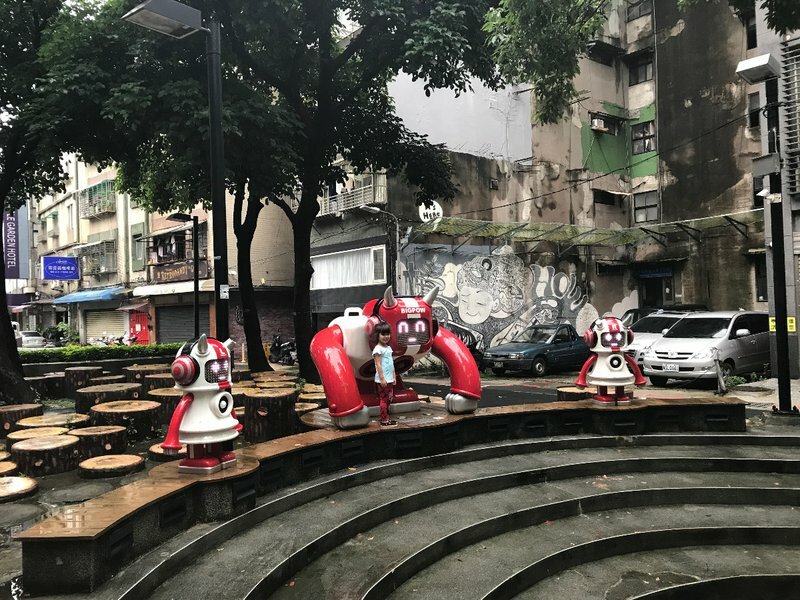 On the way we discovered a cool little sculpture park. 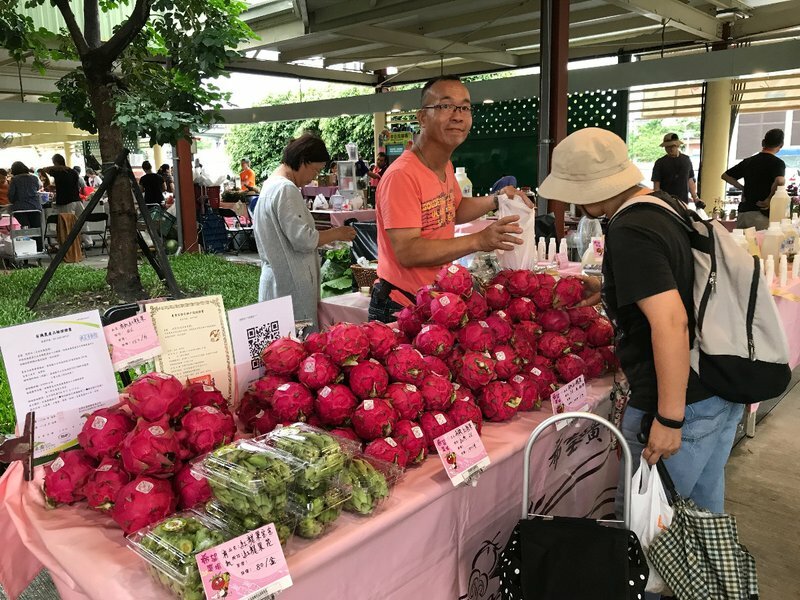 The farmers' market was awesome, with a huge selection of fresh produce and artisanal foods. 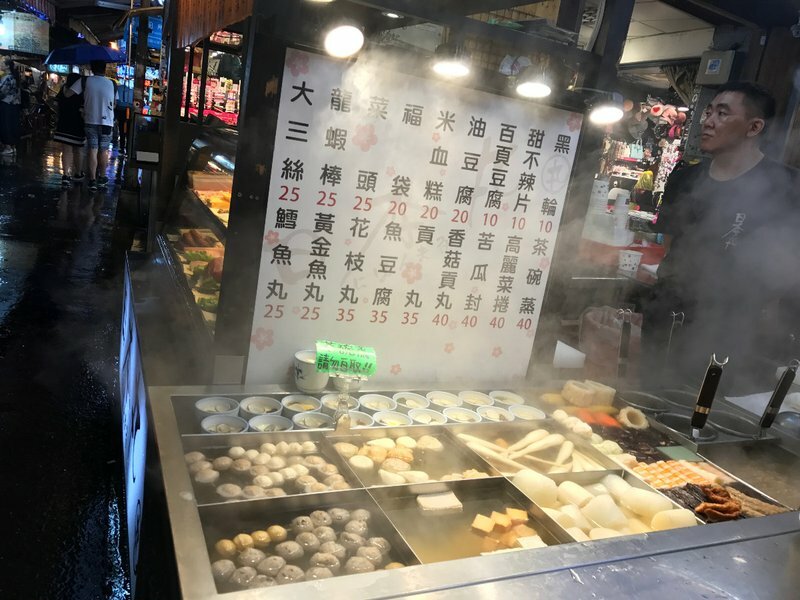 There was also a food court with plenty of dumplings and soups. 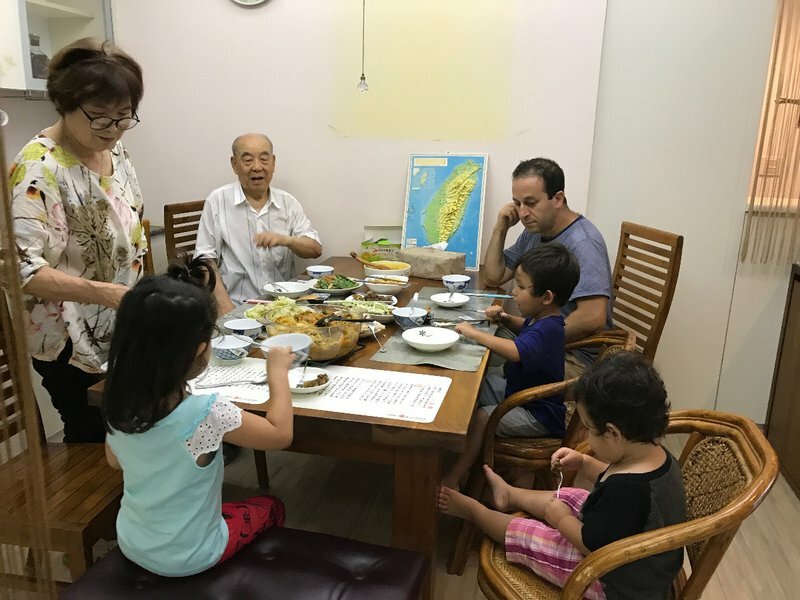 After a brief stop at the Miniatures Museum we went back to Mei Ling's grandfather's house for dinner. 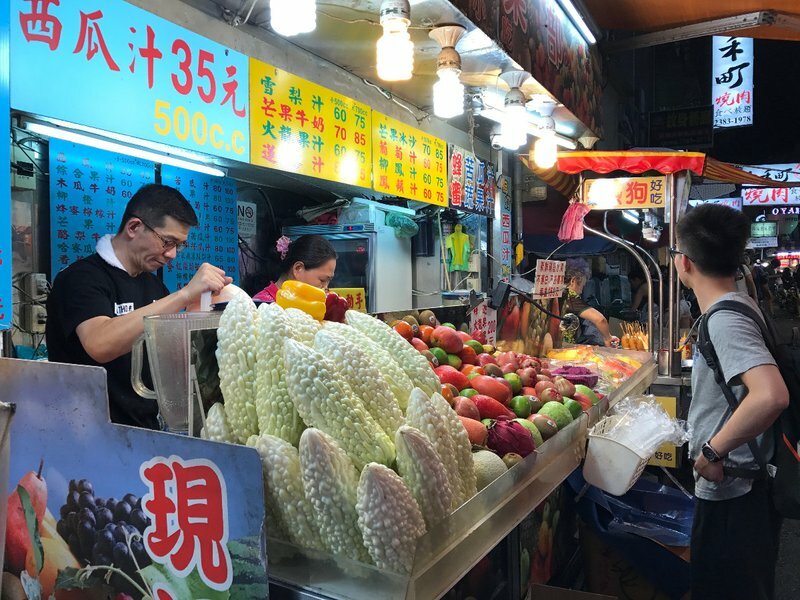 In the late evening we took a taxi to the Raohe night market which we enjoyed despite nonstop heavy rain. 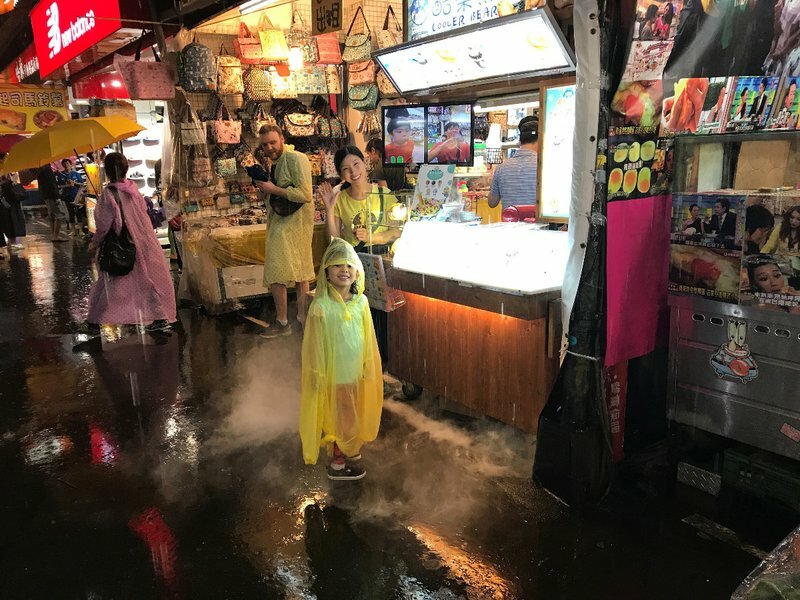 It amazes me how the Taiwanese crowds still came out in the evenings for the night markets regardless of the weather. On Sunday we began our day with another market breakfast and then checked out a weekend crafts fair. The kids especially enjoyed watching bead necklaces being made. 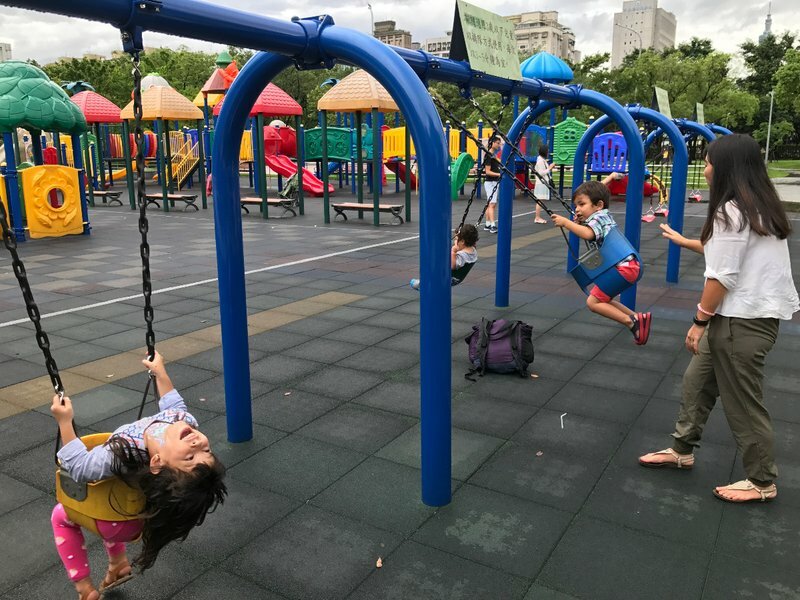 Afterwards, we walked to Daan Forest Park where the drizzle stopped just long enough for the kids to get a little playground time. 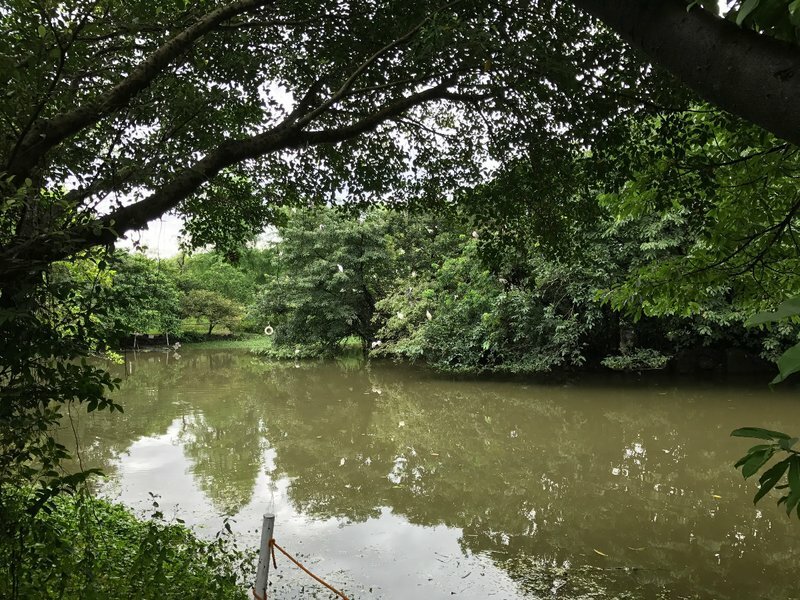 The small pond in the park was absolutely packed with bird life. 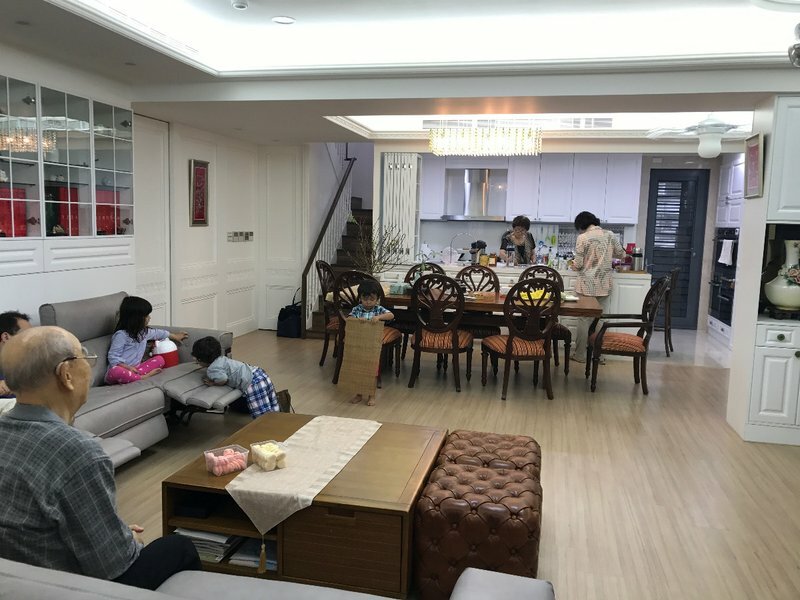 We joined Mei Ling's family for lunch and let the kids play at her aunt's house for the rest of the afternoon. 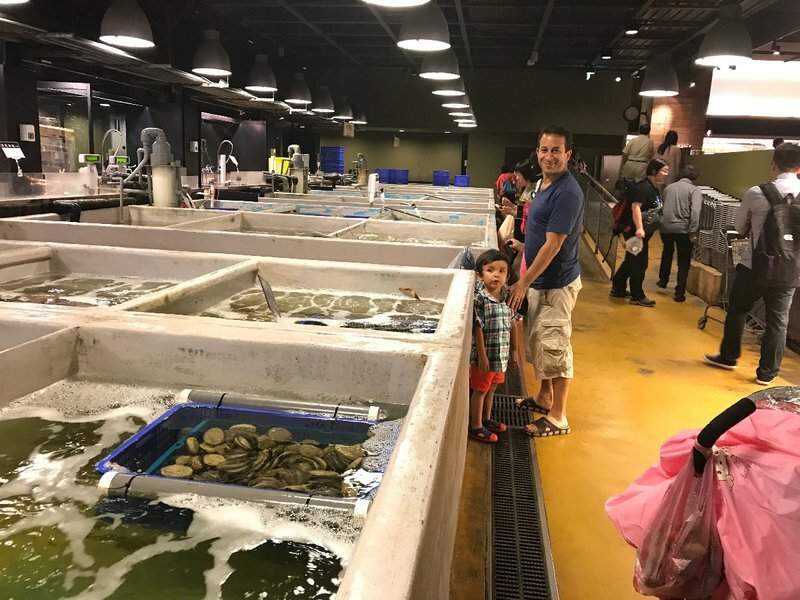 In the evening we went to Addiction Aquatic Development, an oddly-named complex of seafood markets and restaurants in northern Taipei, not far from Shilin. 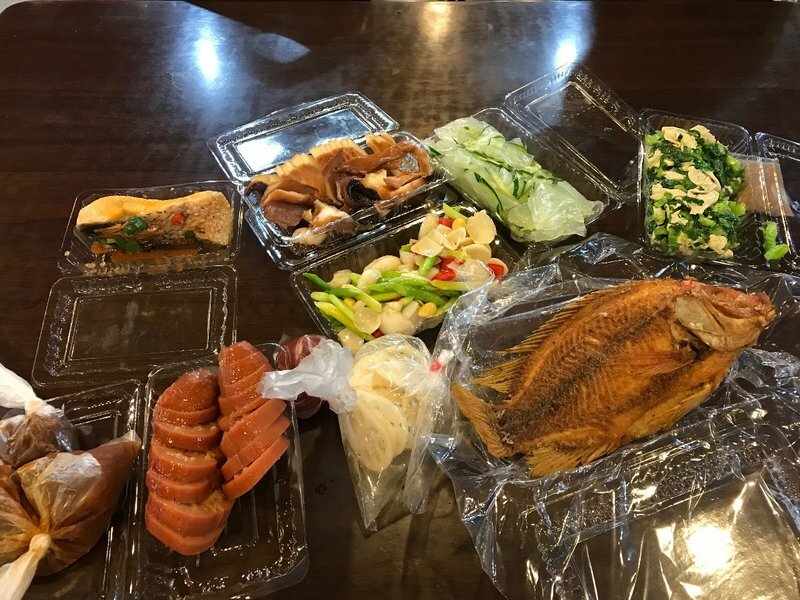 I'd discovered it when searching for a major seafood market like Tsukiji in Tokyo or Noryangjin in Seoul. All my searching only identified this one location, which was variously described as a market and a restaurant. 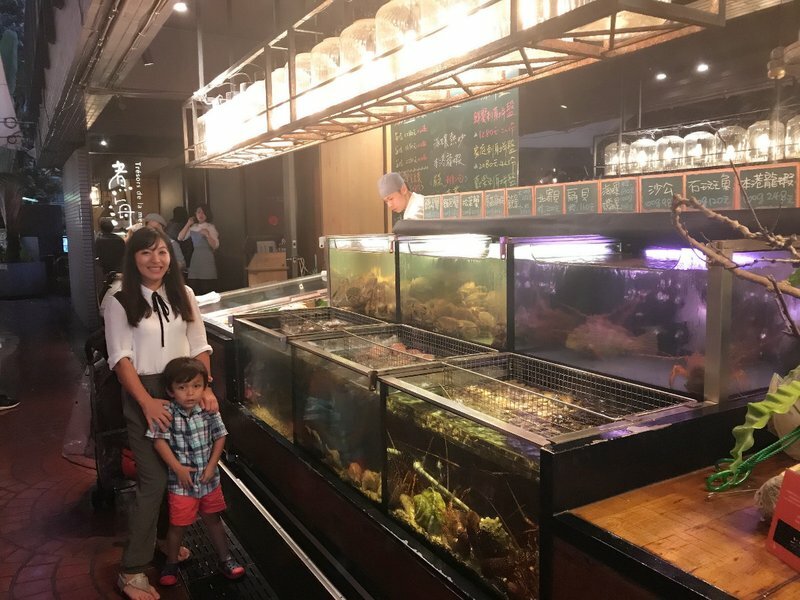 The confusion was likely due to the fact that the original fish market was redesigned in 2012 and was now predominantly devoted to restaurants and retail stores selling prepared seafood, with only one small market selling live fish. 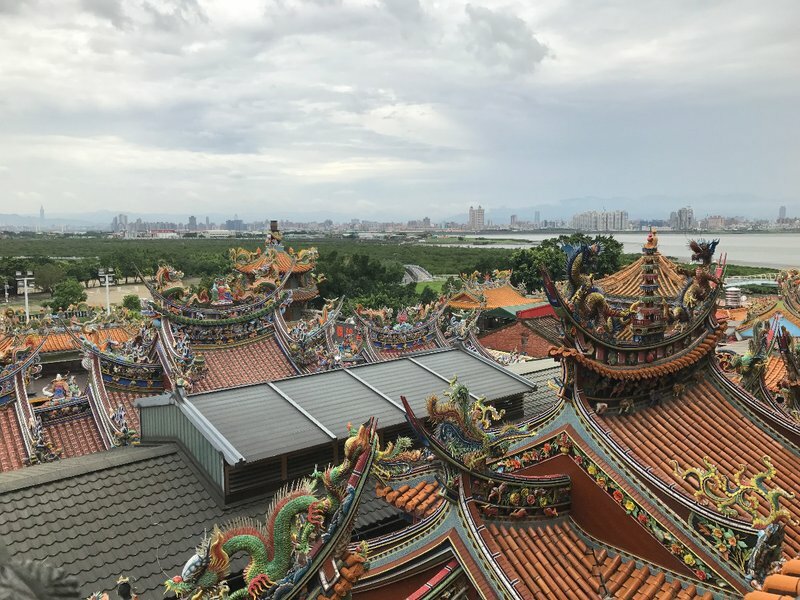 Either way, the market was nothing comparable to what we had experienced in other major East Asian cities. It seemed like there were far more Westerners here than we had seen anywhere else in Taipei as well. 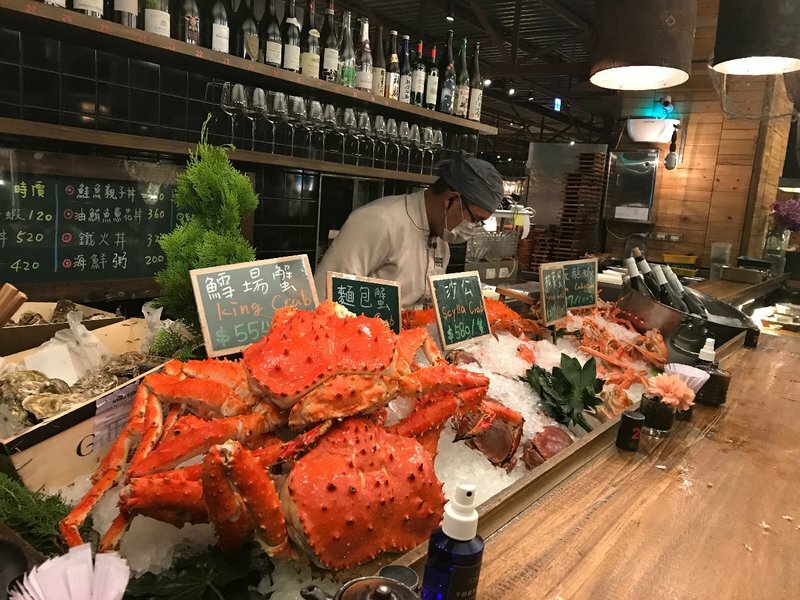 We eventually selected a restaurant and splurged on a couple of huge king crab legs as well as a shellfish hotpot. 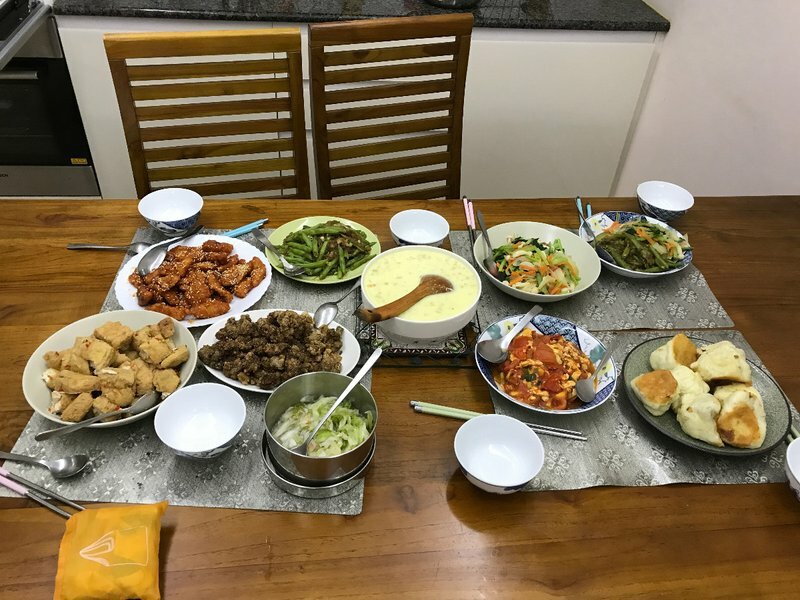 The most memorable thing about the meal wasn't the food itself, but the opportunity to make wasabi paste the traditional way by grating the root on the bottom of a spiky dish. For the first time we got back to Ximending early enough to visit Red House, an imposing octagonal red brick structure just a block from our Airbnb. The building apparently contains some performance spaces but we only found a number of boutiques selling clothing and handicrafts. 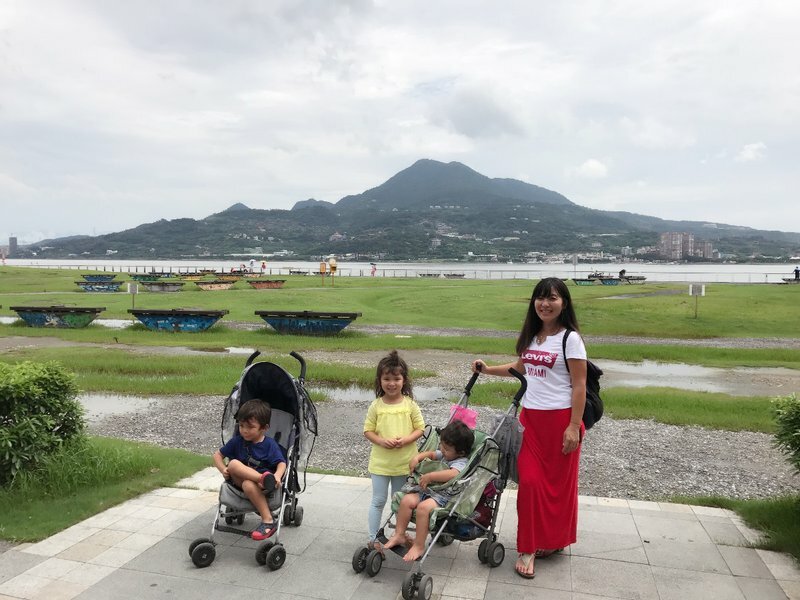 We spent most of our last day in the northern suburbs of Beitou and Tamsui, which I'll cover in detail in the day trips post. 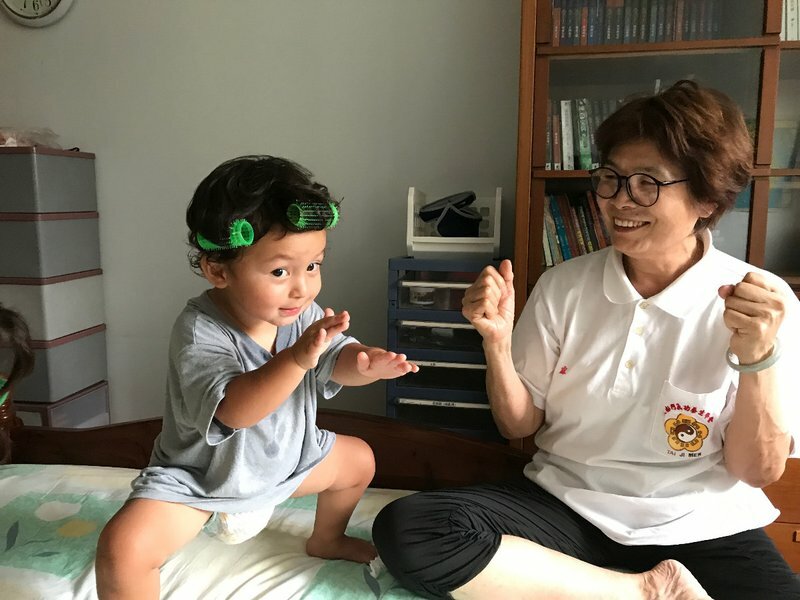 In the late afternoon we returned to Shilin where we had another home-cooked meal and Mei Ling's aunt taught Spenser some tai chi moves. 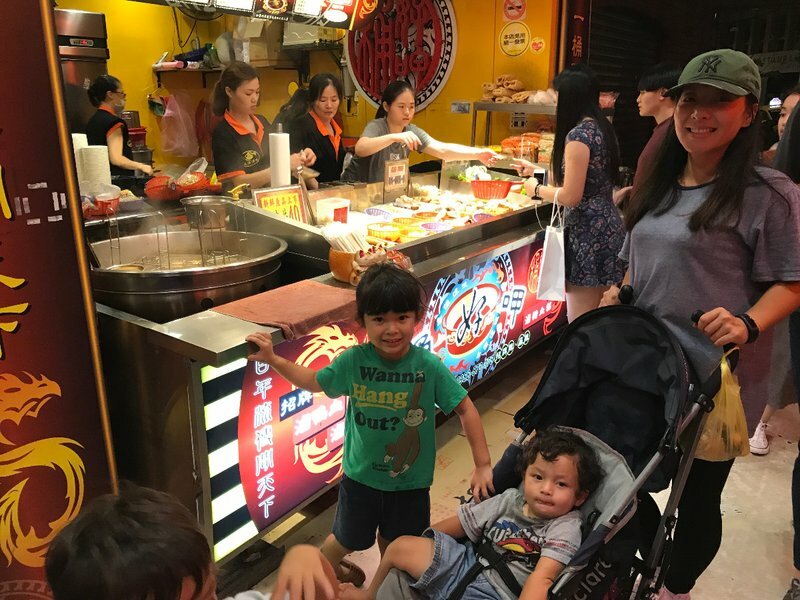 We closed out our visit to Taipei with a final visit to the Shilin night market. 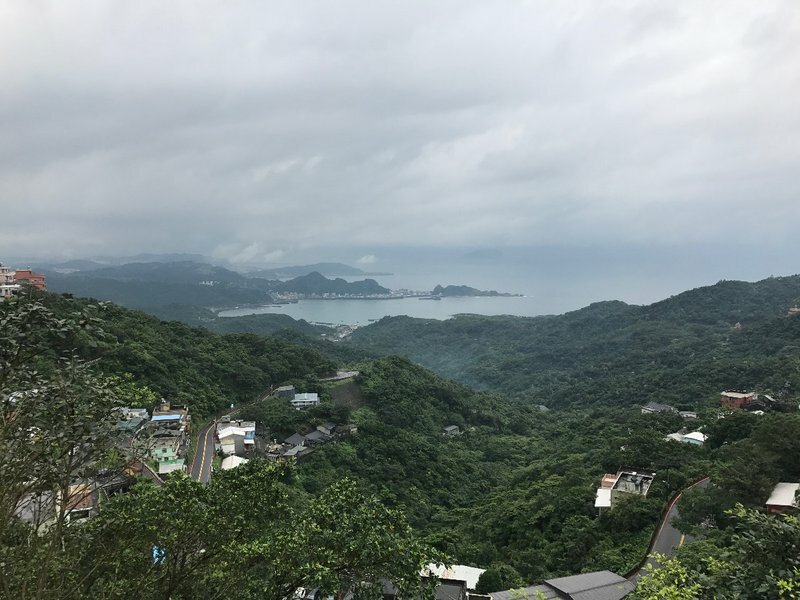 Mainly due to the terrible weather, we missed a lot of things I had listed as worth seeing in Taipei such as Elephant Mountain, Songshan Park, and Treasure Hill. 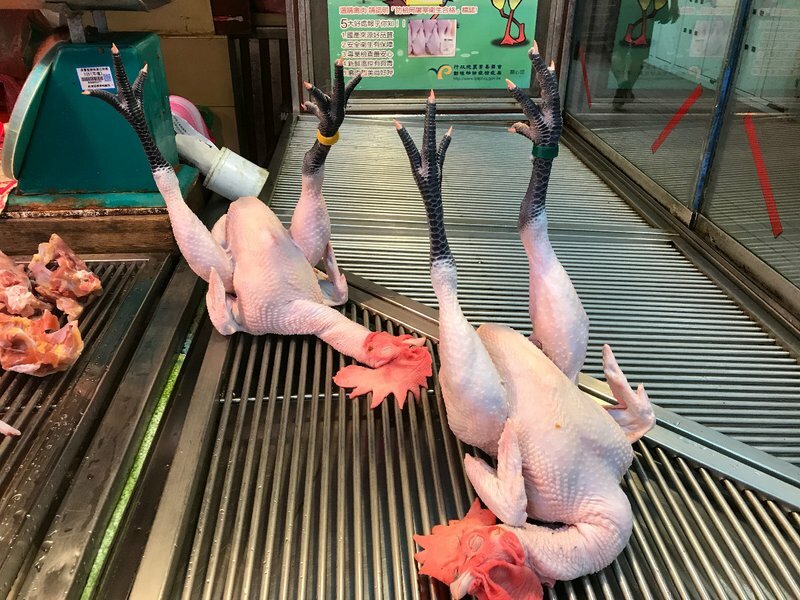 We also only made it to three of the more than ten named night markets. 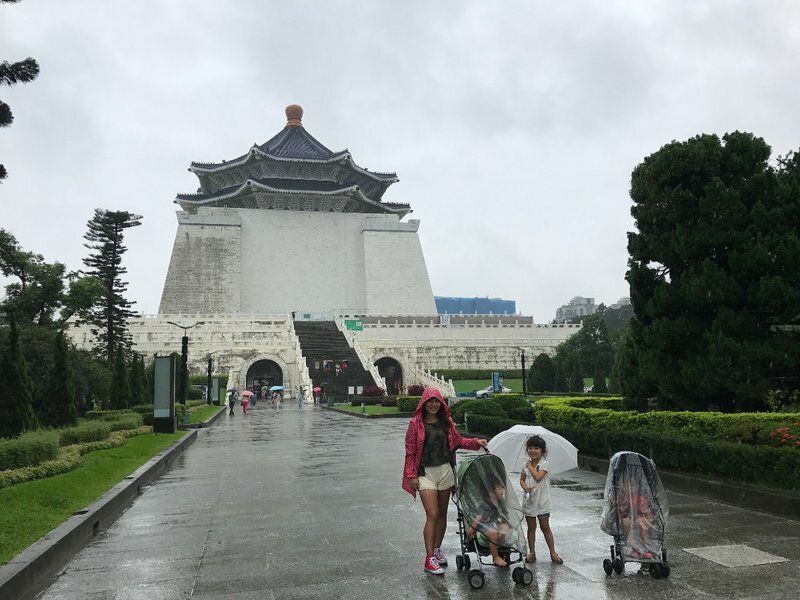 Fortunately, I know we'll be returning to Taipei when the kids are older and more independent and I'm sure we'll have better weather the next time. 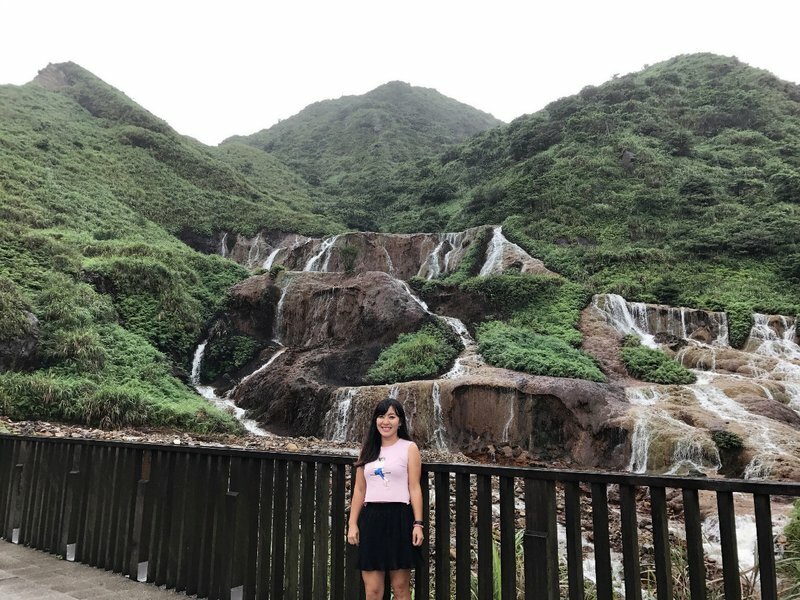 Hopefully I won't be too old by then to do the hiking and rafting that the rest of Taiwan is famous for.